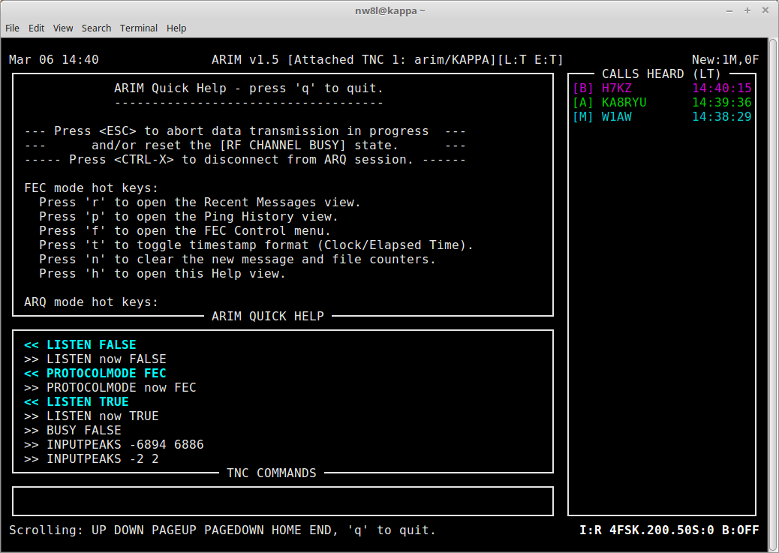 ARIM means "Amateur Radio Instant Messaging" and the ARIM program is a host mode program for the ARDOP TNC being developed by Rick KN6KB and John G8BPQ. ARIM is written in C and distributed as source code under the terms of the GPL 3.0 license. Developed on Ubuntu Linux, it should compile and run on any modern Linux installation (including Raspbian for Raspberry Pi). Using Microsoft Windows? No problem, ARIM will build and run in the excellent Cygwin environment for Microsoft Windows. Alternatively, on Windows 10, ARIM can be built in the Bash on Ubuntu on Windows environment too. Either of these environments let you build and run ARIM on the same Windows host that ARDOP_Win or ARDOP_2Win are installed on. Compiling the source code is easy, the only build dependency beyond the standard C libraries are the ncurses and zlib development libraries. 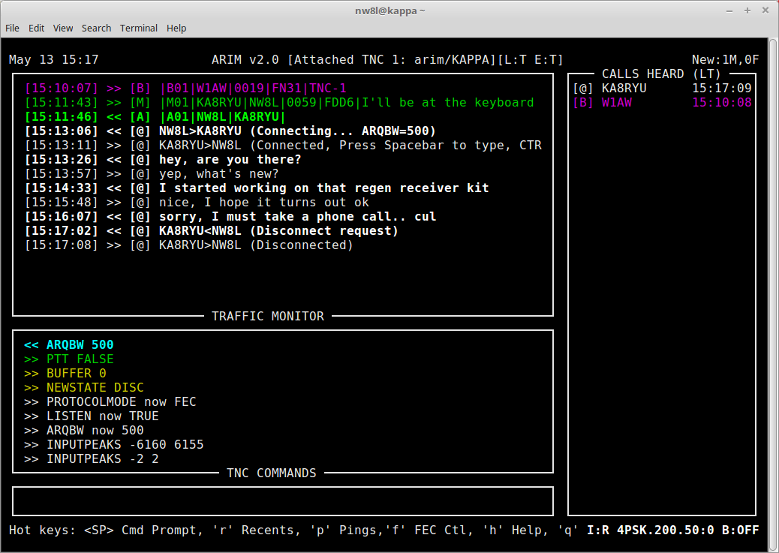 Uses a TUI (text user interface), suitable for running in an SSH session and using only the keyboard for input. 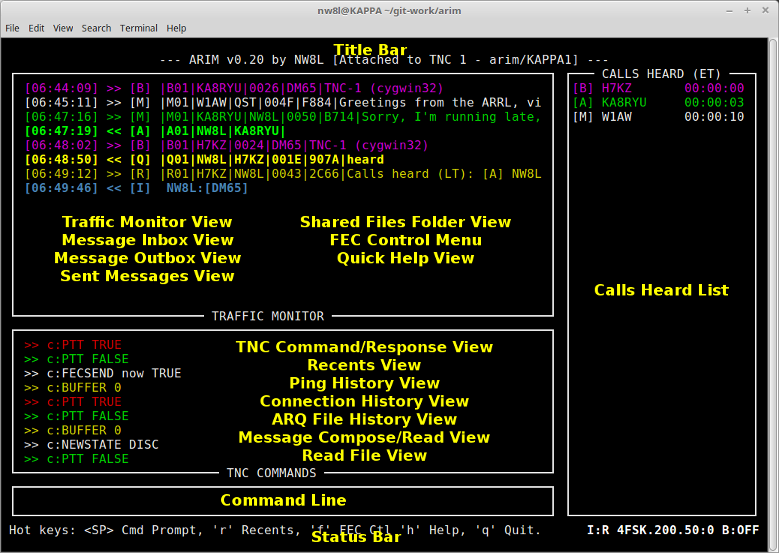 If running in a GUI terminal emulator, ARIM automatically resizes itself when the terminal window is resized. 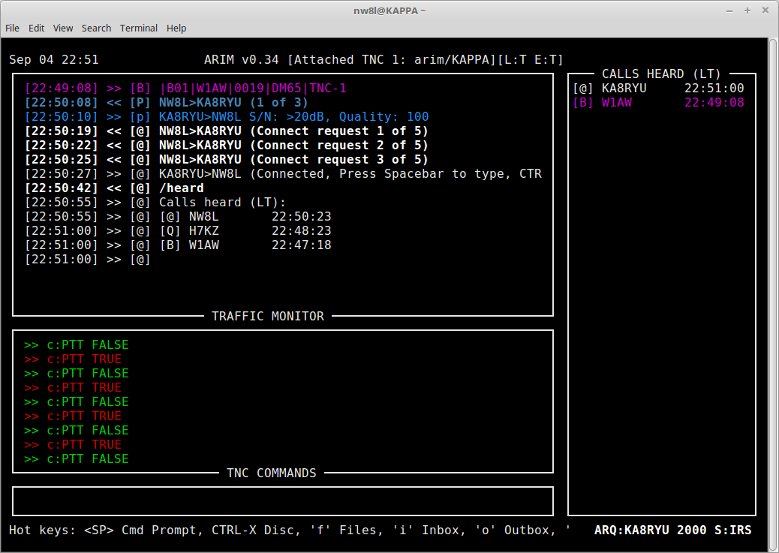 Attaches to ARDOP software TNCs running on the local host or remote hosts over a TCP connection. Can attach to a TNC-Pi9K6 hardware TNC mounted on a Raspberry Pi host, over a serial port. Uses .ini style configuration file for program settings. Allows multiple TNC configurations to be defined in the configuration file. Operator may attach or detach from any of them while ARIM is running. Each TNC has separate station and net call sign list, port name etc. Uses a connectionless all-text protocol layered over the ARDOP FEC mode transport, using 8-bit character encoding. Selective call is supported and data payloads are verified by a 16-bit CCIT checksum. 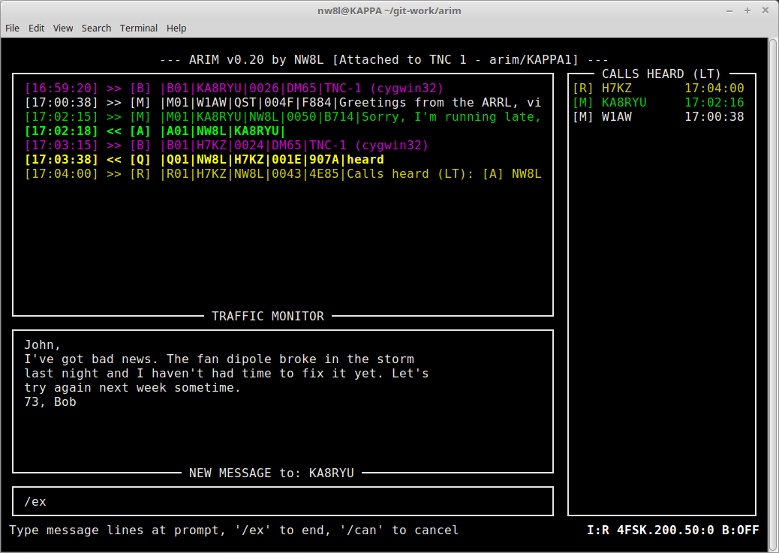 Allows the operator to send an ARDOP "ping" frame to another station and view the resulting signal report. Allows casual keyboard-to-keyboard chat using "unproto" FEC text transmissions. Supports ARDOP ARQ mode both as client and as a server for keyboard to keyboard chat and access to BPQ BBSs with ARDOP ports. Allows file uploads and downloads in ARQ mode (both text and binary file types), with a compression option. This sends the message or file in RFC 1950 "zlib" format, using the "deflate" compression method documented in RFC 1951. The data is automatically decompressed at the receiving station to recover the original file or message. Supports mutual authentication of ARQ sessions using a digest access authentication scheme. This can be used to confirm the identity of the connected station or control access to designated "access-controlled" shared files directories. Displays a "calls heard list" view showing stations heard on the air, including timestamp and type of frame last heard. Displays a "recents list" view showing recently received messages from other stations. 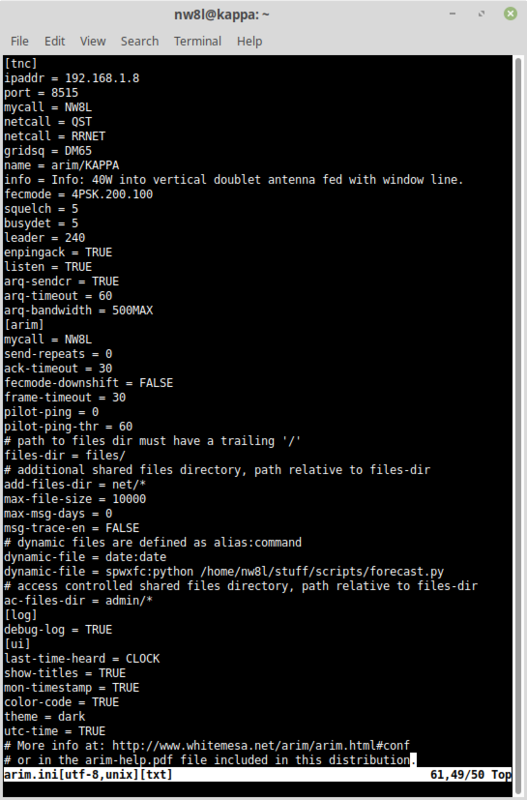 Displays a "ping history" view showing ping activity, including signal reports and timestamps, for each station for which pings have been either sent or received. Displays a "connection history" view showing ARQ connection activity, including grid square locators, session start and duration times, and number of bytes sent and received. Displays a traffic monitor view showing heard ARIM and ARDOP frames, with a 500 line scrollback buffer and optional timestamps. Displays a TNC command/response view allowing the operator to issue commands to the TNC and monitor its "async response" stream. Supports beaconing with announcement of call sign, grid square and TNC name. Allows the operator to send text messages addressed to a specific station call sign or net call sign. Confirms message receipt with short ACK frame sent by receiving station to sending station (only when message is addressed to a station call, not a net call). At the receiving station, the message is automatically stored to the inbox for later reading. At the sending station, if no ACK frame is received, the operator is prompted with a choice to either store the message to the outbox or discard it. Allows the operator to forward received text messages to another station or a net, or to save received text messages to a file. Supports query of remote stations for information such as ARIM and TNC versions, grid square, calls heard list, shared text files and text generated by scripts (dynamic files). Displays status flags in message listing to indicate if a message has been read (R), forwarded (F) or saved to file (S). Allows messages to be composed "off-line" (no TNC attached) and stored to the message outbox to be sent later. After transmission messages are stored in the "sent messages" mailbox. Offers option for automatically purging messages from mailboxes aged beyond a specified number of days. Alternatively, this process can be invoked manually from the message listing views. Offers option for automatically repeating attempts to send a message if the result is a NAK or an ACK timeout, with option to progressively "downshift" to a more robust FEC mode each time. Offers option for sending "pilot pings" in advance of attempts to send a message or query, or to initiate an ARQ session. If the destination station fails to respond to the pilot pings, the transaction is abandoned to prevent tying up the channel when propagation is poor or the destination station is off the air. In this case, the operator is prompted with a choice to either store the message to the outbox or to discard it. Offers option for message tracing using RFC-822 style Received: headers. In this way a record of the message's progress through a network is built up as it is forwarded from station to station. Offers options for separate message traffic logging and debug trace logging with automatic daily log rotation. Offers convenient menu driven control of TNC's FEC mode and frame repeat count settings. Includes text file reader for files in the shared files directory as well as the arim.ini configuration file. The ARIM program is a work in progress and I am interested in feedback. I monitor the ARDOP Users group at groups.io and can be reached there, or at the arim-ham Yahoo group where files and other information will be posted. The ARIM screen is divided into different sections. Some of these can host more than one "view". The current view is identified by the title at the bottom of these sections. Where L means "listen", E means "enpingack" and v is either T for TRUE or F for FALSE. [B] indicates an ARIM beacon frame. [M] indicates an ARIM message frame. [Q] indicates an ARIM query frame. [R] indicates an ARIM response frame. [A] indicates an ARIM ACK frame. [N] indicates an ARIM NAK frame. [I] indicates an ARDOP ID frame. [P] indicates an ARDOP PING frame. [p] indicates an ARDOP PINGACK frame. [U] indicates an "unproto" (non-ARIM) ARDOP FEC frame. [@] indicates an ARDOP ARQ frame. [E] indicates a bad ARDOP frame. [!] indicates a bad ARIM frame. Listing the message inbox contents in response to the li command. Listing the message outbox contents in response to the lo command. Listing sent messages in response to the ls command. Listing shared files in response to the lf command. 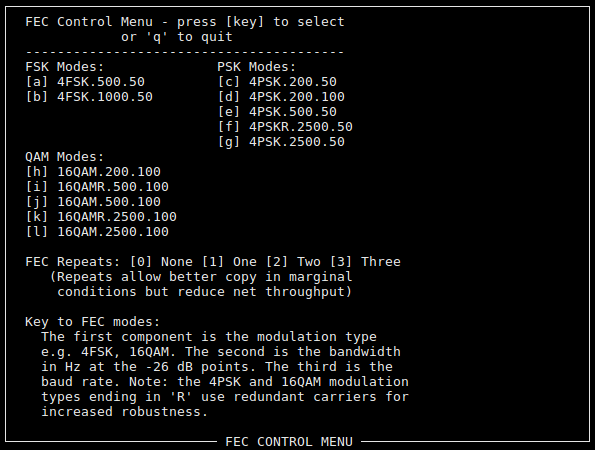 Displaying the FEC Control Menu in response to the 'f' hot key. Displaying the Help contents in response to the 'h' hot key. Any of these secondary views can be closed by pressing the 'q' key. When view titles are enabled these views will be identified by their title at the bottom of the monitor view area. Listing recently received messages. Press 'r' to open this view; press 'r' again to close it. Listing the TNC's ping history. Press 'p' to to open this view; press 'p' again to close it. Listing the TNC's connection history. Press 'c' to to open this view; press 'c' again to close it. Composing multi-line messages in response to the 'sm' and 'cm' commands. The message is entered line by line at the command prompt and displayed here. 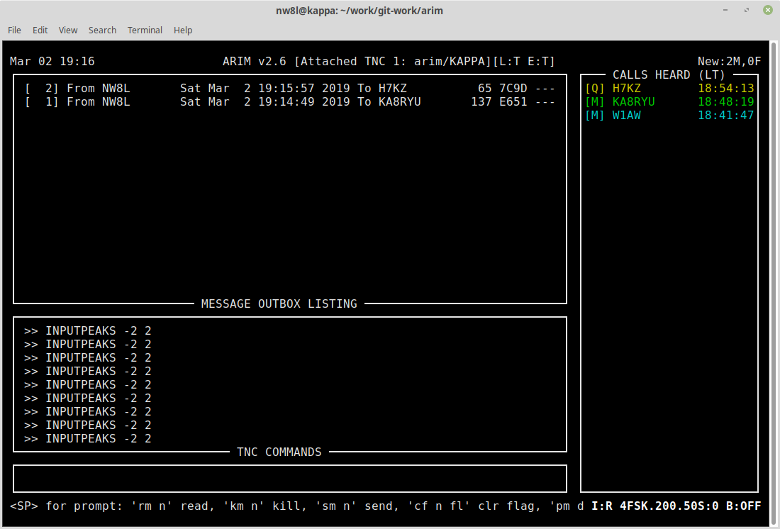 Displaying messages from the inbox or outbox in response to the rm command. Command Line Press <SP> to open a command prompt here. Commands can be directed to the TNC (if attached) by prefixing them with the '!' character. Text prefixed with the ':' character is sent over the air as "upproto" ARDOP FEC frames if attached to a TNC. Unproto transmissions allow interoperation with stations using ARDOP Chat FEC mode. In ARQ chat mode text entered here is sent to the connected station. Calls Heard List Here are displayed the call signs of stations heard on the air, listed in reverse chronological order (most recent first). Each entry also shows the frame type and time heard. Time heard can be either last time heard, indicated by "(LT)" in the list title, or elapsed time since last heard, indicated by "(ET)". The format is HH:MM:SS for last time heard, and DD:HH:MM for elapsed time. ARIM:TNC status indicator - format is I/B:T/R where ARIM state is either I (idle) or B (busy) and TNC state is either T (transmitting) or R (receiving). When busy, new transmissions are blocked. However, pressing the <ESC> key when busy will cancel the current operation and return ARIM to the idle state so that a new message or query can be sent immediately. FEC mode and repeat count indicators - format is fecmode:fecrepeat . These can be changed by pressing 'f' to open the FEC Control Menu and selecting new values. Beacon status indicator - shows the beacon interval time in minutes, or "OFF" if disabled. Use the btime command to change the beacon interval time. Busy channel indicator - displays [RF CHANNEL BUSY] when the TNC reports that the channel is busy. When this is seen, transmissions are inhibited until the channel is quiet again. The busydet parameter in the [tnc] section of the arim.ini configuration file controls the sensitivity of the TNC's channel busy detector. BUSY notifications are not sent by the TNC to ARIM during an ARQ session, so this indicator will not appear then. Input lockout indicator - format is ! , displayed when the TNC is busy with a file transfer. When present, text or commands entered at the command prompt are ignored. Remote station call sign - format is ARQ:CALL[+]. Starting with ARIM v1.2, the optional suffix + is appended to the call sign if the ARQ session is authenticated. Connection bandwidth - format is BW where BW is the maximum bandwidth negotiated when the ARQ connection was made, for example 2000. TNC state indicator - format is S:STATE where STATE is usually one of ISS, IRS, IDLE or DISC. ARQ message transfers - Message uploads and downloads (/MPUT, /MGET). ARQ file transfers - Binary file uploads and downloads (/FPUT, /FGET). ARQ file listing transfers - File listing uploads and downloads (/FLGET, /FLPUT). FEC message transfers - Message uploads and downloads (SM). FEC query response transfers - Query response uploads and downloads (SQ). Color coding can be enabled by setting the color-code parameter in the [ui] section of the arim.ini configuration file to TRUE (the default). When enabled, elements in the traffic monitor view, calls heard list and TNC command view are color coded to highlight the different frame/command types and group related traffic flows together. The color scheme is controlled by the theme setting. User defined custom themes can be used in addition to the built-in DARK and LIGHT themes. The default theme is DARK, whose color scheme is described below. The traffic monitor view and TNC command view show very different types of information so different color coding schemes are used for each. The calls heard view is just a reflection of information in the traffic monitor view and uses the same color coding conventions. Traffic Monitor/Calls Heard ARIM frame types are color coded according to frame type and the call sign to which they are addressed. This makes it possible to distinguish traffic sent to or from the TNC call or net call from other traffic. Outgoing frames are printed in a bold font to distinguish them from incoming frames. 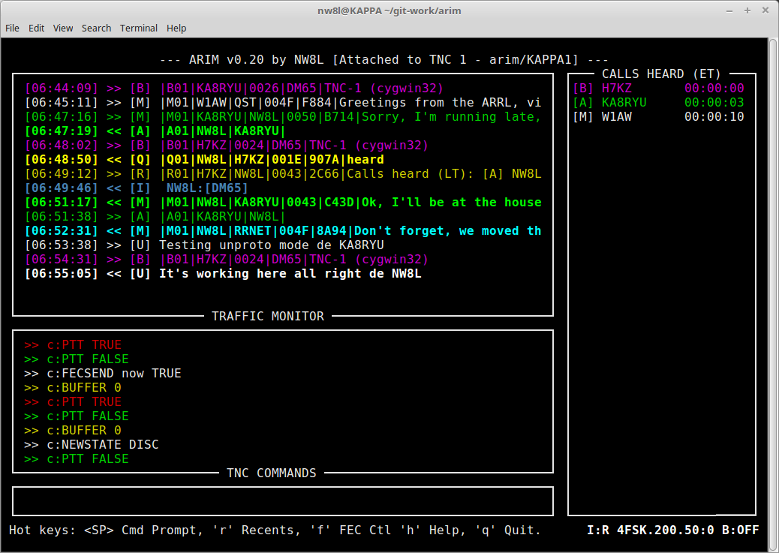 ARIM Message/Ack frames (mycall) [M] and [A] frames sent to or from the TNC 'mycall' call sign are colored green. 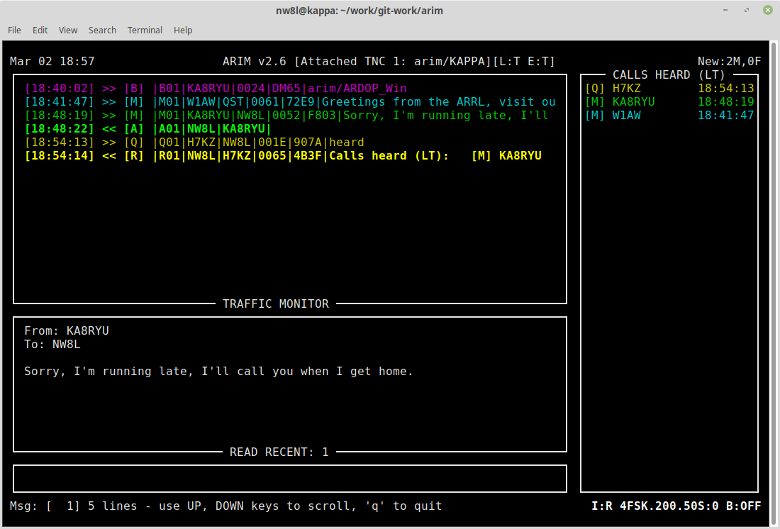 ARIM Message frames (netcall) [M] frames sent to or from a TNC 'netcall' call sign are colored cyan. This makes net traffic stand out in the traffic monitor view. 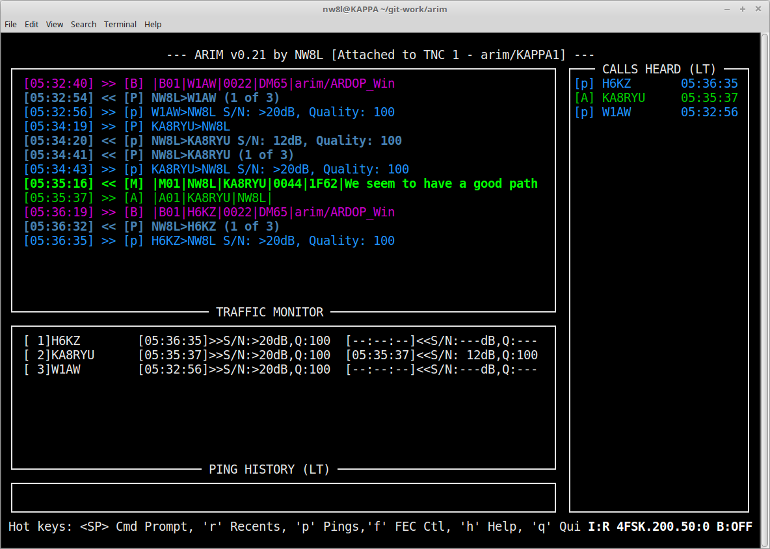 ARIM Query/Response frames [Q] and [R] frames sent to or from the TNC 'mycall' call sign are colored yellow. ARIM Nak frames [N] frames sent to or from the TNC 'mycall' call sign are colored red. ARIM Beacon frames [B] frames sent or received from any station are colored magenta. ARIM Error frames [!] frames addressed to a TNC 'mycall' or 'netcall' call signs are colored red. ARDOP ID frames [I] frames sent or received from any station are colored blue. ARDOP PING/PINGACK frames [P]/[p] frames sent to or from the TNC 'mycall' call sign are colored blue. ARDOP Error frames [E] frames sent or received from any station are colored red. Other frames All other monitored frames are colored white. This includes various ARDOP frame types (e.g. ARQ frames) and ARIM frames not addressed to the TNC call sign or net call sign. TNC Commands TNC commands are distinguished by function and direction of travel. This makes it easier to follow the interactions between the ARIM host program and the TNC and recognize TNC state changes announced in the asynchronous response stream. Commands from Host to TNC These are bolded and colored cyan. PTT TRUE async responses are colored red. PTT FALSE async responses are colored green. BUFFER status async responses are colored yellow. BUSY status async responses are colored magenta. where name is the name of the theme. This erases the terminal window and re-draws it using the specified theme. Note: themes work only when the color-code parameter in the [ui] section of the arim.ini configuration file is TRUE. # bluebird is an example custom theme, adjust to taste. BLACK, RED, GREEN, YELLOW, BLUE, MAGENTA, CYAN, and WHITE. BLINK, BOLD, DIM, ITALIC, NORMAL, REVERSE, STANDOUT and UNDERLINE. Not all of these attributes work on a given terminal type; you'll need to experiment with them. Up to 5 themes can be defined. Example themes are included in the distributed arim-themes file. Use these as a starting point for your own custom themes. See the arim(5) man page for details. 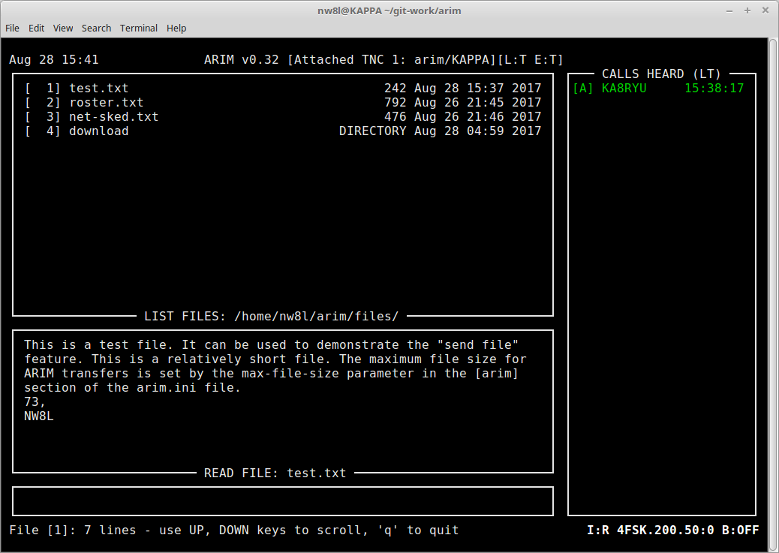 To view the contents of the arim-themes file, open the shared files viewer and enter the rt command. Do this to learn the names of custom themes for use with the themes command. The prerequisite for ARIM is the ARDOP TNC. Both version 1 and version 2 TNCs are supported. 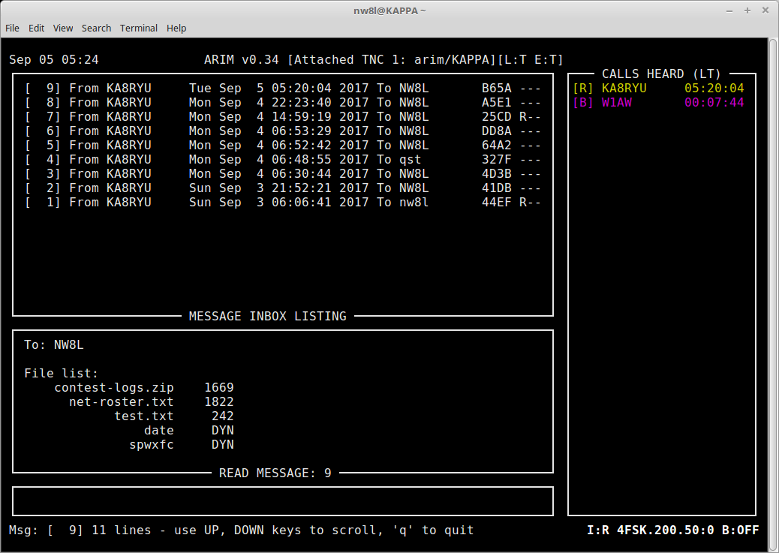 Version 1 ardopc for Linux, piardopc for the Raspbian OS on RPi, and ARDOP_Win for Microsoft Windows. Recommended versions are 1.0.4.1b-BPQ for ardopc and piardopc, and 1.0.4 for ARDOP_Win. Version 2 ardop2 for Linux, piardop2 for the Raspbian OS on RPi, and ARDOP_2Win for Microsoft Windows. Recommended versions are 2.0.3.9-BPQ for ardopc and piardopc, and 2.0.4 for ARDOP_Win. TNC-Pi9K6 ARDOP_Teensy or ARDOP2_Teensy running on the TNC-Pi9K6 TNC. Use the latest source code, which is available in the TeensyProjects.zip archive on G8PBQ's download site. Learn more about configuring and using the TNC-Pi9K6 here. ARIM v2.6 is not compatible with ARDOP_2Win TNCs earlier than version 2.0.4. It is compatible with ardop2 and piardop2 v2.0.3.9-BPQ and later. ARIM v2.6 is not compatible with ARIM v1.9 and earlier. It is compatible with gARIM v0.1 and higher. 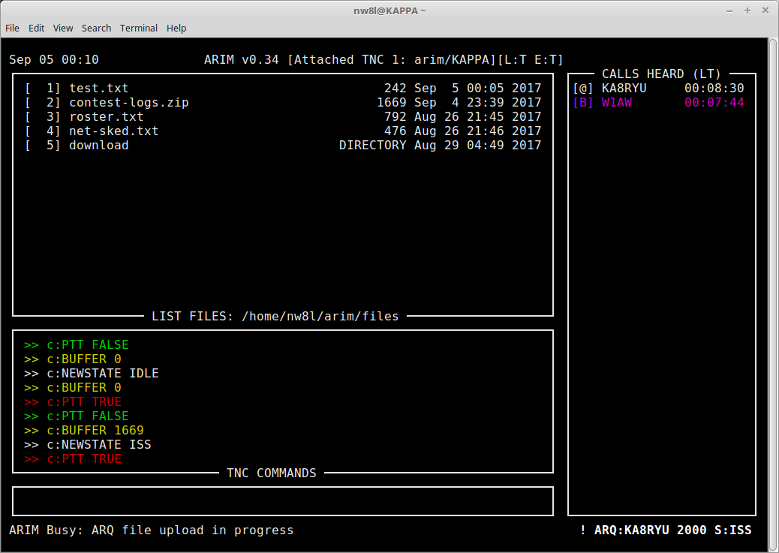 ardopc TNC for Linux Operating Systems provides instructions applicable to the ardopc, ardop2, piardopc and piardop2 TNCs, which are available for download here. 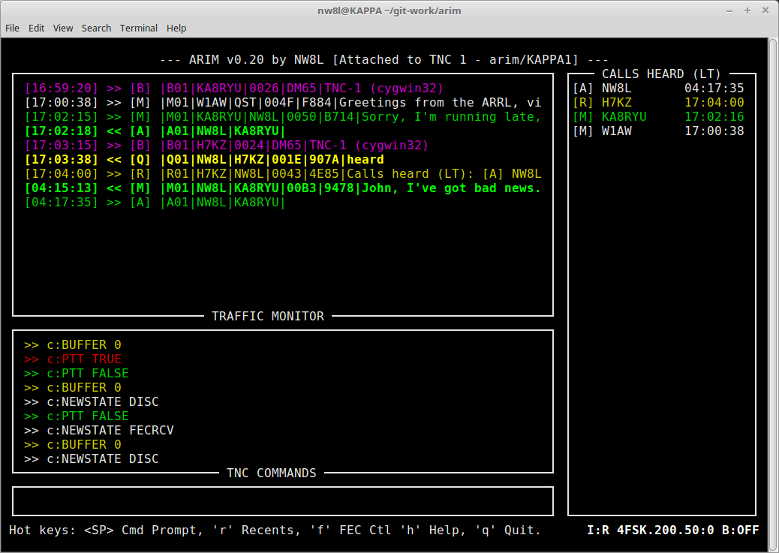 ARDOP_Win or ARDOP_2Win TNC (part of the ARDOP Chat installation) for Windows Operating Systems. To download the ARDOP Chat installer you must be a member of the ARDOP Users group at groups.io. The installer is found in the Files area of the group. If you plan to run ARIM in the Cygwin environment on Windows, then Cygwin must be installed first. The installer for this is found on the Installing and Updating Cygwin Packages page. The Cygwin Walkthrough and Beginner's Guide may be helpful in getting started. If you plan to run ARIM in the Bash on Windows environment on Windows, then the Windows Subsystem for Linux must be installed first. How to Install and Use the Linux Bash Shell on Windows 10 describes installation and use of Bash on Windows. Microsoft publishes a helpful Bash on Windows FAQ which is part of their official Bash on ubuntu on Windows site. When using Cygwin, you will work in the Cygwin Terminal. A shortcut to the Cygwin Terminal should be placed on your Windows desktop by the Cygwin installer. When using Bash on Windows, you will work in the Bash Terminal launched by the "Bash on Ubuntu on Windows" Start Menu item. Next, you need to either build ARIM from source or download a "portable" precompiled binary package. to unpack the arim-2.6 directory. This contains source code files and other information including build instructions and this help file. This installs the arim executable, arim(1) and arim(5) man pages, and additional documentation including this help file. The arim(1) man page documents arim command line options and the arim(5) man page documents the arim.ini configuration file (use the command man 5 arim to read it). To compile from sources you need the GNU compiler, gcc, the make utility and the ncurses and zlib development libraries and headers. The INSTALL file included with the source distribution contains detailed instructions for installing these and building ARIM from source. at the command prompt. The first time ARIM runs it will create a directory named arim in your home directory containing data files and a model arim.ini configuration file. It also contains three subdirectories: files for shared files, doc with symbolic links to documentation including this Help file, and log for log files. Once created, the contents of the arim directory will not be overwritten by subsequent installations of ARIM or deleted if ARIM is uninstalled. The links in the doc directory will always point to the most recently installed documentation files. To configure ARIM, open the arim.ini file in a text editor and edit as needed. You must define at least one TNC by setting call signs, the grid square locator, and TNC IP address and port number. If editing the file in Windows, use a text editor that understands the Unix text file format, like Wordpad or the freeware text editor Programmer's Notepad. On hosts with IPv6 enabled, 'localhost' may not work as the address for an ARDOP TNC instance running on the same Windows PC. Use the IPv4 address of the host, e.g. "192.168.1.54", or the IPv4 loopback address "127.0.0.1" instead. The IPv4 address can be discovered by running ipconfig from the command line. If running ARDOP_Win or ARDOP2_Win, set this address in the Virtual TNC Setup dialog box as well. Alternatively, on Red Hat derived Linux systems, you can follow these instructions to build an RPM package from the ARIM source distribution, and use it to install ARIM. to unpack the arim-2.6 directory. This contains the executable file, data files and a model arim.ini file. It also contains three subdirectories: files for shared files, doc with copies of documentation files including this help file, and log for log files. 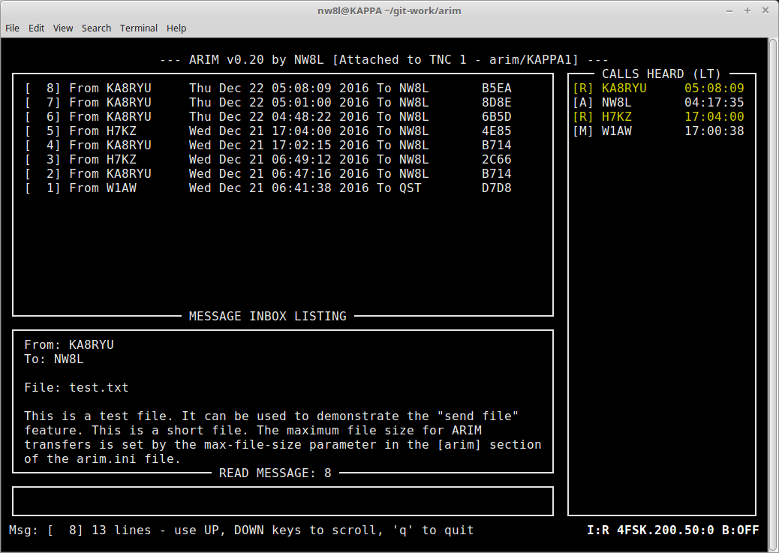 The arim-2.6 directory can be copied anywhere (e.g. a USB flash stick) and ARIM run from it locally, so it's called the "portable" installation. It's self-contained, with messages, shared files and log files moving with the directory if it's relocated. The "./" preceding the file name tells the system to run the copy of arim located in the current directory. Multiple TNCs can be defined. A subset of the ARDOP TNC parameters are initialized here, but these can be overridden from the TNC command line after the program starts. Most options have reasonable default values which are used if they are not found in the .ini file. [tnc] Each TNC is configured in a separate [tnc] section. The first [tnc] section in the file defines port 1, the second port 2, and so on. The limit is 10 TNC definitions. interface The TNC interface type, either TCP for connecting to a software TNCs like ardop2 or ARDOP_2Win, or SERIAL for connecting to the TNC-Pi9K6 hardware TNC. Default: TCP. ipaddr The IPv4 address of the TNC, either in "dotted quad" numerical form or a host name e.g. 'localhost' or 'DELL-1520.example.net'. Max length for host names is 253 characters. Default: 127.0.0.1. NOTE: On hosts with IPv6 enabled, 'localhost' may not work as the address for an ARDOP instance running on the same host. Use the IPv4 address of the host, e.g. "192.168.1.54", or the IPv4 loopback address "127.0.0.1" instead. The IPv4 address can be discovered by running ipconfig from the command line. If running ARDOP_Win or ARDOP2_Win, set this address in the Virtual TNC Setup dialog box as well. port The TCP port on which the TNC is listening. Default: 8515.
serial-port The serial port device name, for example /dev/serial0, used to connect to the TNC-Pi9K6 hardware TNC on a Raspberry Pi host. Max length for device names is 63 characters. Default: /dev/serial0. serial-baudrate The baud rate for the serial port used to connect to the TNC-Pi9K6 hardware TNC, either 9600, 19200, 38400, 57600 or 115200. Default: 115200.
mycall The station call sign, e.g. NW8L or NW8L-4, max length 10 characters. Call must be no longer than 7 characters and may have optional SSID in ranges: -A to -Z or -0 to -15. ARIM will respond to queries and messages addressed to this call. Messages will be stored in the inbox. Default: NOCALL. netcall A net call sign, e.g. RRNET, max length 10 characters. Any printable characters are allowed. When sending a message to this call, no ACK is expected. When receiving, ARIM will recognize messages addressed to this call and store them in the inbox but no ACK will be returned to prevent channel congestion. ARIM will not respond to queries addressed to the net call. Up to 8 net call signs may be defined for a TNC. Default: one netcall, QST. gridsq The station's grid square locator. It must be a well formed Maidenhead locator, either 4, 6 or 8 characters long. Examples: DM65 or DM65qf or DM65qf15. Letter pairs are not case-sensitive. Default: DM65. btime The beacon interval time in minutes, or 0 to disable the beacon. Max time is 999 minutes. Default: 0.
reset-btime-on-tx Control whether or not the beacon timer is reset when the station transmits an ARDOP frame. This is useful to prevent beacon transmissions from interfering with traffic between stations, e.g. on a net. This setting has no effect when the beacon is disabled. Set to TRUE to enable beacon timer reset on transmit, FALSE to disable it. Default: FALSE. name A name assigned to the TNC and advertised by the beacon, e.g. RRNET/ARIM. This is also returned when the TNC receives the ARIM 'pname' query. Max length is 31 characters. Default: Empty. info Information describing the TNC, returned in response to the 'info' query. Use the character pair \n to indicate a line break if you want to format the text into multiple lines; this will be converted to a newline character in the response. Max length is 127 characters. Default: Empty. ARDOP v1.x 4FSK.200.50S, 4FSK.500.100S, 4FSK.500.100, 4FSK.2000.600S, 4FSK.2000.600, 4PSK.200.100S, 4PSK.200.100, 8PSK.200.100, 4PSK.500.100, 8PSK.500.100, 4PSK.1000.100, 8PSK.1000.100, 4PSK.2000.100, 8PSK.2000.100, 16QAM.200.100, 16QAM.500.100, 16QAM.1000.100 or 16QAM.2000.100. ARDOP v2.x 4PSK.200.50, 4PSK.200.100, 16QAM.200.100, 4FSK.500.50, 4PSK.500.50, 16QAMR.500.100, 16QAM.500.100, 4FSK.1000.50, 4PSKR.2500.50, 4PSK.2500.50, 16QAMR.2500.100 or 16QAM.2500.100. Max length is 20 characters. Default: 4PSK.200.50. fecrepeats The initial ARDOP FECREPEATS value. This is the number of times each FEC frame will be repeated by the sender. This may be useful when propagation is poor, but at the cost of reduced throughput - depending on FEC mode, an ARIM frame may extend across multiple ARDOP FEC frames, each of which will be repeated. Max value is 5. Default: 0.
fecid The initial ARDOP FECID value, which controls whether or not an ARDOP ID frame is sent by the TNC at the start of FEC transmissions. Set to TRUE to enable FECID, FALSE to disable it. Default: FALSE. leader The initial ARDOP LEADER time in msec. The leader is a special 50 baud two tone signal which precedes data transmission, used by the receiving TNC for synchronization. This may need to be adjusted to compensate for loss of leader due to delays in PTT or VOX keying or audio path latencies in some SDR radios. Range is 120-2500. Default: 240.
trailer The initial ARDOP TRAILER time in msec. Range is 0-200. Non-zero trailer time is only needed for certain SDR radios and is a function of the audio processing latency relative to release of PTT. For these cases try a value of 100-200 msec. Default: 0.
squelch The initial ARDOP SQUELCH setting. This controls the sensitivity of the TNC's leader detector. Lower values mean greater sensitivity but also greater risk of false triggering. Range is 1-10. Default: 5.
busydet The initial ARDOP BUSYDET setting. This controls the sensitivity of the TNC's busy detector. Lower values mean greater sensitivity but also greater risk of false triggering. Setting the value to 0 disables the busy detector. The busy detector should be disabled only in an emergency situation or in very high local noise environments. Range is 0-10. Default: 5.
listen Control whether or not the TNC listens for ARQ connect requests or pings from other stations. Set to TRUE to enable listening, FALSE to disable it. Default: TRUE. enpingack Control whether or not the TNC responds to pings from other stations. Set to TRUE to enable ping ACKs, FALSE to disable them. Default: TRUE. This is useful for passing TNC commands which are not managed by ARIM, such as (future) radio control commands, and for TNC test and development purposes. Commands are send verbatim without validation of the command name or its parameters. Max length is 128 characters. You may define no more than 32 tnc-init-cmd parameters. Default: None. ARDOP v1.x 200MAX, 500MAX, 1000MAX, 2000MAX, 200FORCED, 500FORCED, 1000FORCED or 2000FORCED. 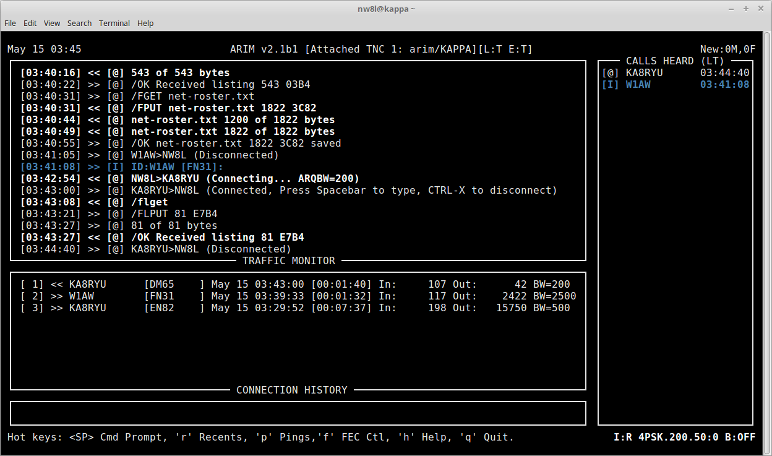 ARDOP v2.x 200, 500 or 2500.
arq-negotiate-bw Controls whether or not the TNC will negotiate ARQ bandwidth for incoming connections. Set to TRUE to enable bandwidth negotiation, FALSE to disable it. Default: TRUE. This feature currently supported by ARDOP_2Win TNC version 2.0.4 only. arq-timeout The inactivity timeout for ARQ connections in seconds. Range is 30-600. Default: 120.
arq-sendcr Control whether or not CRLF line endings are sent in ARQ mode, instead of Unix style LF endings. Set to TRUE to send CR, FALSE to send only LF. Default: TRUE. [arim] This section holds settings for the ARIM messaging protocol. mycall The call sign used as the "from" address for messages. Default: NOCALL. send-repeats The number of times an ARIM message will be repeated in the absence of an ACK response from the recipient. It is recommended that this value not exceed 3 to prevent tying up the channel with repeats in poor conditions. Max is 5. Default: 0.
ack-timeout The maximum time in seconds after sending a message that ARIM will wait for an ACK before repeating it. Applies when send-repeats is not 0. Max is 999 seconds. Default: 30.
fecmode-downshift Control whether or not the FEC mode is progressively "downshifted", or changed to a more robust mode each time an ARIM message is repeated after a NAK or ACK timeout. Set to TRUE to enable, FALSE to disable downshifting. Default: FALSE. This works in tandem with the 'send-repeats' parameter. If 'fecmode-downshift' is TRUE and 'send-repeats' is nonzero, then progressively more robust FEC modes are used for re-transmissions after a NAK or timeout. The mode of last resort is 4PSK.200.50. For example, if the initial mode is 4PSK.500.100, then downshifting would progress to 4FSK.500.100, then 16QAM.200.100, and so on. The original FEC mode is restored after the message send operation completes. This is experimental. There are many kinds of channel impairments and no single downshift strategy is best for all. For details look at the FEC mode downshift table in the arim_proto.c source code file. frame-timeout The time in seconds after which an incomplete ARIM frame will be abandoned and the receive buffer cleared. Because an ARIM frame may be spread over many ARDOP frames, a failure to receive one or more ARDOP frames will cause an ARIM timeout. Max is 999 seconds. Default: 30. This grants full access to the contests directory in the shared files root directory. This exposes not only the files in contests, but also the hierarchy of subdirectories rooted there. Subdirectories such as contests/2016 or contests/2016/June are visible, and a remote station may list and download the files they contain. Max length is 255 characters. NOTE: you may define no more than 16 add-files-dir parameters. Default: None. This grants full access to the admin directory in the shared files root directory. This exposes not only the files in admin, but also the hierarchy of subdirectories rooted there. Subdirectories such as admin/2016 or admin/2016/June are visible, and a remote station may list and download the files they contain. Max length is 255 characters. NOTE: you may define no more than 16 ac-files-dir parameters. Default: None. max-file-size The maximum size of files that can be transferred in an ARIM message. The output of the flist query is filtered in accordance with this limit. To disable access to shared files, set this to 0. Max is 16384 bytes. Default: 4096.
max-msg-days The maximum age, in days, for messages to be kept in the inbox, outbox and sent messages mailbox. Messages that exceed this limit are automatically purged whenever the corresponding message viewer is opened in ARIM (using the 'li', 'lo' or 'ls' commands). Set to 0 to disable the automatic message purge feature. Default: 0.
msg-trace-en Set to TRUE to enable message tracing, FALSE to disable it. Default: FALSE. When enabled, headers like Received: from KA8RYU by NW8L; Jan 30 2019 05:01:48 UTC are inserted into messages at the time of receipt. If the message is forwarded to another station with tracing enabled, another Received: header is added by the receiving station, and so on. In this way a record of the message's progress through a network is built up as it is forwarded from station to station (read from bottom to top). Use absolute paths to script files when ARIM is built from source and installed. Relative paths can be used for "portable" binary installations where the script files are contained in same directory as the arim executable file. Dynamic files are used to return the output of a script or system command in response to a file query. alias must be unique among any other dynamic file definitions and file names in the shared files root directory. In response to the query sq file alias, command will be executed in a shell and its output returned in the response. command can be a batch file, a script invocation like python myscript or a system command like date or uname -a. The output size in bytes is limited by the max-file-size parameter. Errors generated by dynamic file scripts are written to a file named dyn-file-error-YYYYMMDD.log in the log directory. Max length is 128 characters. NOTE: you may define no more than 16 dynamic-file parameters. Default: None. pilot-ping The number of times a pilot ping will be repeated in the absence of a PINGACK response from the recipient. It is recommended that this value not exceed 3 to prevent tying up the channel with repeats in poor conditions. Set to 0 to disable pilot pings; otherwise the range is 2-15. Default: 0.
pilot-ping-thr When pilot pings are enabled, this is the threshold by which signal reports from the target station are judged. If the reported constellation quality is above the threshold, the message (or query) send proceeds; if below this threshold it is canceled. It is recommended that this value be 60 or higher; choose a threshold suitable for the FEC mode in use. Min is 50, Max is 100. Default: 60. [log] Logging settings appear in this section. debug-log Set to TRUE to enable debug logging, FALSE to disable it. Default: FALSE. traffic-log Set to TRUE to enable traffic logging, FALSE to disable it. Default: TRUE. tncpi9k6-log Set to TRUE to enable TNC-Pi9K6 debug logging, FALSE to disable it. Default: TRUE. [ui] User interface settings appear in this section. 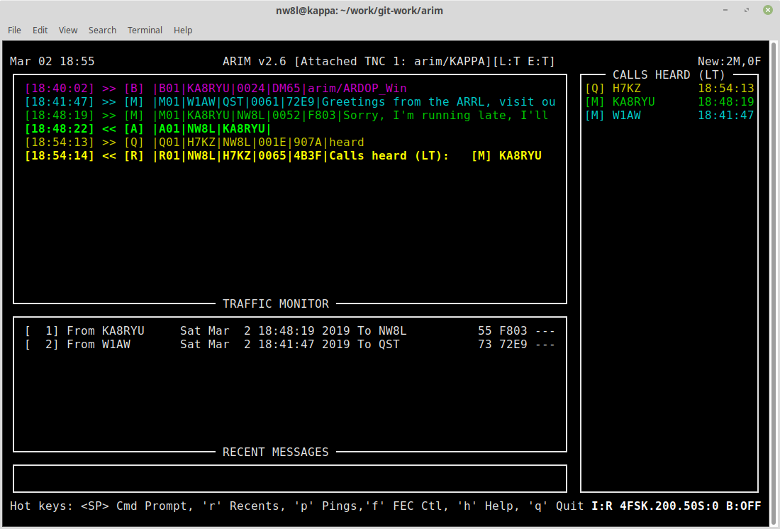 color-code Set to TRUE for color coding of items in the traffic monitor view, calls heard list and TNC command view according to the scheme discussed in the Color Coded Display and UI Theme Options section. Set to TRUE to enable, FALSE to disable color coding. Default: TRUE. show-titles Set to TRUE to show titles for all views (panes) in the UI, FALSE to hide them. Default: TRUE. last-time-heard Selects the timestamp format used in various views. Set to CLOCK to indicate time station was last heard, in HH:MM:SS format (either local time or UTC). Set to ELAPSED to indicate elapsed time since station last heard, in DD:HH:MM format. Default: CLOCK. mon-timestamp Set to TRUE to enable timestamps in the traffic monitor view. Set to FALSE to disable them. Default: FALSE. Prior to version 0.12 this was located in the [arim] section. utc-time Selects the time zone used for timestamps in the UI and log output, and for the clock in the title bar. Set to TRUE for UTC, and FALSE for local time. Default: TRUE. theme A theme name which selects the UI theme. This controls the color coding and text attributes of various UI elements. Two built-in themes are always available, DARK and LIGHT (DARK is the original ARIM theme). Up to 5 additional named themes may be defined in the arim-themes file. Default: DARK. Note: themes work only when the color-code parameter is TRUE. In the file is a listing of the parameters and their values after processing, which can be helpful for troubleshooting. Any invalid parameter values will be replaced with default values, and parameters with misspelled names will be absent. The ARIM program has no rig control features! It depends on the rig control features embedded in the ARDOP TNC. ARDOP_2Win: Choose "Optional Radio Setup" from the File menu. This opens the "Radio Settings" dialog where you may configure rig control. Be sure to check the "Enable TNC Control of Radio or PTT" box at the bottom of the dialog. 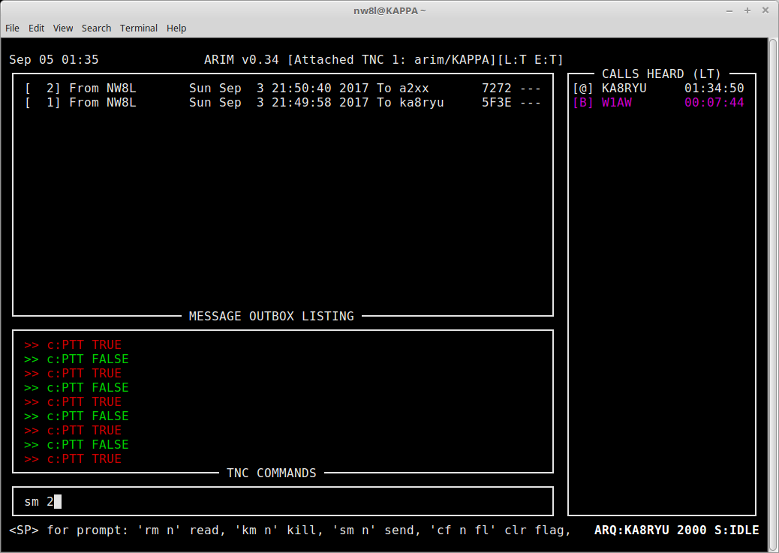 ardopc, ardop2: Supports PTT. Detailed instructions are found in the Running ARDOPC guide by G8BPQ. I use VOX on my rig and it seems that Signalink cards work too. In both cases the VOX hold or SignaLink DLY must be set to minimum. Make sure the ARDOP TNC is running. Press the spacebar to open the command prompt. Enter the att command, a space and the TNC number, e.g. att 1. 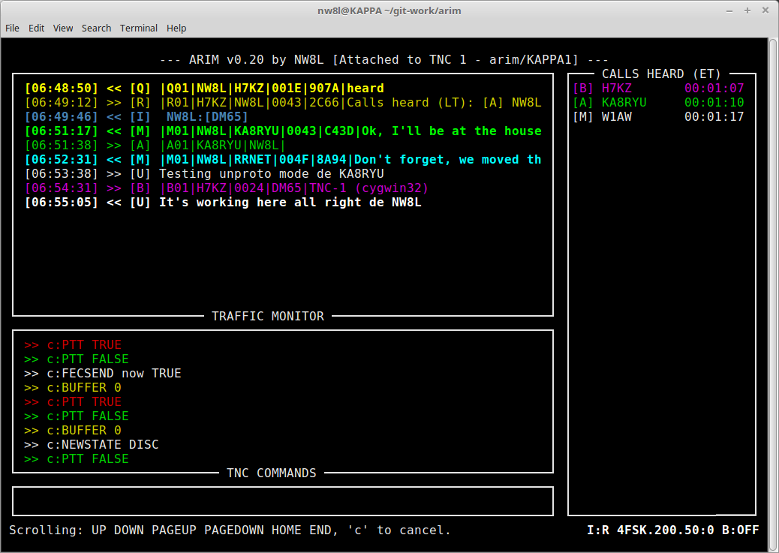 The TCP connection will be made and initialization commands from the program to the TNC will scroll by in the TNC Command view. The title bar will display the number and name of the attached TNC. To detach from the TNC, open the command prompt and enter the det command. Press the 'h' hot key to open the Help viewer. Here is a listing of all hot keys and commands. Use the UP and DOWN arrow keys or the PAGEUP, PAGEDOWN, HOME and END keys to scroll through the contents. Press 'q' to quit. Press the 'r' hot key to toggle on the Recents view. Message number, most recent first. Size over-the-air transfer size in bytes, decimal format (before compression). Checksum 16-bit CRC, in hexadecimal format. Status flags where R means read, F means forwarded, S means saved and - means flag not set. Press the 'u' and 'd' keys to scroll the list up and down. To read a message, press the spacebar to open the command prompt and enter the command rr nbr, where nbr is the message number. This opens the message viewer. The message number and size in lines are shown in the Status Bar. Use the UP and DOWN arrow keys or the PAGEUP, PAGEDOWN, HOME and END keys to scroll through the message. Press 'q' to quit the message viewer and return to the Recents view. To clear the view, enter clrrec at the command prompt. Press the 'p' hot key to toggle on the Ping History view. Press 't' to toggle the timestamp format between elapsed time or the clock time. Press the 'u' and 'd' keys to scroll the list up and down. To clear the view, enter clrping at the command prompt. Press the 'c' hot key to toggle on the Connection History view. Press the 'u' and 'd' keys to scroll the list up and down. To clear the view, enter clrconn at the command prompt. Press the 'f' hot key to open the FEC Control Menu. Press a key to select one of the options. All FEC modes are listed here, as well as options to set the FEC frame repeat count to either 0, 1, 2 or 3. Use the UP and DOWN arrow keys or the PAGEUP, PAGEDOWN, HOME and END keys to scroll through the menu contents. Press 'q' to quit. Note that these are ARDOP settings; the ARIM message repeat count found in the arim.ini configuration file is a different thing. The ARDOP FEC repeat count affects all FEC transmissions by the TNC. NOTE: In all views, the current FEC mode and repeat count are indicated in the status bar, to the left of the beacon time indicator. The format is fecmode:fecrepeat. Time last heard (LT) in format HH:MM:SS. Elapsed time since last heard (ET) in format DD:HH:MM. This affects the timestamps shown in the Calls Heard list and Ping History view. Press the 'n' hot key to clear the new message and new file counters, located on the right-hand side of the Title Bar. Press 'y' to proceed or 'n' to cancel. The counters increment when a new message or file is received. They are helpful as indicators of activity during periods of unattended operation. Note that files received in FEC mode are encapsulated in a message or query response frame, so the message counter is incremented, not the file counter. New messages are listed in the convenient Recent Messages view; press 'r' to toggle this on and off. New message and file counter values are lost when the program is closed. Sometimes it's necessary to abort a transmission in progress or halt a receive operation instead of waiting for it to time out. To do this press the <ESC> key to cancel the operation and return ARIM to the idle state. When transmitting, this makes the TNC stop sending, flushes the transmit buffer, and cancels any pending message repeats. When receiving (or waiting for) an ARIM frame the time out counters are reset and any pending response is canceled, making the TNC available for a new send operation immediately. A confirmation message will appear briefly on the Status Bar and the Busy/Idle indicator will reflect the change. In FEC mode, pressing the <ESC> key also resets the [RF CHANNEL BUSY] state. This may be necessary in rare cases where ARIM's busy state falls out of sync with the TNC's busy detector state. In ARQ mode, pressing the <ESC> key to abort a connection results in a "dirty disconnect". Use CTRL-X to attempt a clean disconnect before resorting to <ESC>. A 500 line scrollback buffer allows review of past traffic. Press the UP or DOWN arrow keys or the PAGEUP, PAGEDOWN, HOME or END keys to start scrolling. The status bar is updated to indicate that scrolling is active. This state persists unless you stop using the movement keys for more than 30 seconds or press 'e' to cancel. Until then the view won't auto-scroll to the end when new traffic is posted. Open the program and press the spacebar to open the command prompt. There are multiple uses for the command line. ARQ chat In ARQ chat mode text entered here is sent out over the air to the connected station. ARIM commands These manage TNCs, beacons, shared files, messages and the UI. att nbr Attach to a TNC. nbr indicates the TNC number. det Detach from the currently attached TNC. btime nbr Set the beacon interval time and start it. nbr indicates the beacon interval in minutes, setting it to '0' disables beaconing. srpts nbr Set the number of times a message send will be repeated in the absence of an ACK response from the recipient. Setting it to '0' disables send repeats. ackto nbr Set the message ACK timeout in seconds. fecds TRUE or FALSE - Enable or disables FEC mode downshifting when repeating messages. srset Open a pop-up dialog showing the current message send repeat settings. mycall call Set the TNC call sign to call. netcall add call Add net call sign call to the list. netcall del call Delete net call sign call from the list. gridsq loc Set the grid square locator to loc. pname name Set the TNC (port) name to name. This appears in ARIM beacon frames. listen TRUE or FALSE - Control whether or not the TNC listens for ARQ connect requests or pings from another station. enpingack TRUE or FALSE - Control whether or not the TNC responds to pings from another station. tncset Open a pop-up dialog showing the current TNC settings. ping call nbr Send ping to remote station call. nbr is the number of pings to send to call in the absence of a response; it must be in the range 2-15.
pping nbr Enable/disable the ARIM pilot ping feature. If enabled, ARDOP pings are sent in advance of a message or query transmission to check if the RF path to the target station is adequate. The signal report contained in the PINGACK response is compared to the pilot ping threshold setting and the transmission of the message or query proceeds only if the reported signal constellation quality meets or exceeds the threshold; otherwise it is canceled. nbr sets the number of ping repeats sent in the absence of a response from the target station; it must be in the range 2-5. If nbr is 0, pilot pings are disabled. ppthr nbr Set the ARDOP signal constellation quality threshold for the pilot ping feature. This must be in the range 60-100.
ppset Open a pop-up dialog showing the current pilot ping settings. 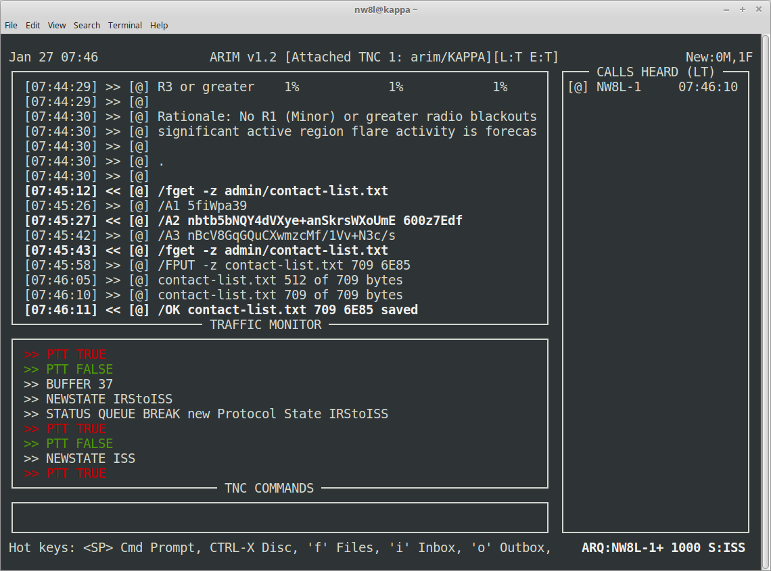 conn call nbr [bw] Initiate ARQ connection with remote station call. nbr is the number of connect requests to send tocall in the absence of a response; it must be in the range 3-15. bw is an optional connection bandwidth (ARQBW) specifier. It can be one of 200, 500, 2500 or any. If any, ARIM will attempt to connect using each ARQBW setting in succession, starting with the current ARQBW setting (set in the ARIM configuration file or by using the arqbw command. This is useful if the ARQBW setting of the remote station is unknown. arqto nbr Set the ARQ connection inactivity timeout. nbr is the time in seconds. arqbw bw Set the ARQ connection bandwidth. bw is a specifier which must be one of: 200, 500 or 2500.
arqnegbw TRUE or FALSE - Controls whether or not the TNC will negotiate ARQ bandwidth for incoming connections. This feature currently supported by ARDOP_2Win TNC version 2.0.4 only. arqset Open a pop-up dialog showing the current ARQ settings. sm call [msg] Send message to station call. The message text may follow the call sign, but if not given then the message composer opens for input. If attached to a TNC the message is sent over the air; if not it is stored in the outbox for sending later. cm call Compose message for station call. The message composer opens for input. When done the message is stored in the outbox for sending later. sq call query Send query query to station call. See the Query another station for information topic for a list of supported queries. Station call will return a message containing the requested information which is stored in the message inbox. li Open the message inbox view. lo Open the message outbox view. ls Open the sent message view. rm nbr Read message number nbr in the message viewer. Only available in the message listing views. rr nbr Read recent message number nbr in the message viewer. Only available in the recent messages view. fm [-z] nbr call Forward message number nbr to station call. In ARQ mode only, the optional -z switch compresses the message to minimize transfer time. Only available from the message inbox and sent messages views when attached to a TNC. sv nbr fname Save message nbr to file fname. fname can be an absolute path like /home/nw8l/foo.txt or a relative path like foo.txt or files/foo.txt. Relative paths are relative to the ARIM working directory (the current directory when arim was invoked). Only available in the message inbox and sent messages views. sm [-z] nbr Send message number nbr to destination station. In ARQ mode only, the optional -z switch compresses the message to minimize transfer time. Only available from the message outbox viewer when attached to a TNC. km nbr Kill (delete) message number nbr. Only available in the message listing views. pm nbr Purge (delete) all messages older than nbr days. Only available in the message listing views. cf nbr flag Clear flag flag on message number nbr. flag is one of R (read), F (forwarded), S (saved) or * (all flags). Only available in the message listing views. lf Open the shared files viewer. rf nbr Read file number nbr in the file reader. Only available in the shared files viewer. sf nbr call (FEC Mode) Send file number nbr to station call. Only available in the shared files viewer. sf [-z] nbr [dir] (ARQ Mode) Send file number nbr to the remote station. The optional -z switch compresses the the file to minimize transfer time. The optional dir parameter specifies the destination directory at the remote station, which is a path relative to the shared files root directory. Only available in the shared files viewer. ri Read the arim.ini configuration file. Only available in the shared files viewer. rp Read the arim-digest password digest file. Only available in the shared files viewer. rt Read the arim-themes UI themes file. Only available in the shared files viewer. cd nbr Open directory number nbr and list its files. Only available in the shared files viewer. rf nbr (ARQ Mode) Read file number nbr in the traffic monitor view. Only available in the remote shared files viewer. gf [-z] nbr [dir] (ARQ Mode) Download file number nbr to the local station. The optional -z switch compresses the the file to minimize transfer time. The optional dir parameter specifies the destination directory at the local station, which is a path relative to the shared files root directory. Only available in the remote shared files viewer. cd -z nbr (ARQ Mode) Open directory number nbr and list its files. The optional -z switch compresses the listing to minimize transfer time. Only available in the remote shared files viewer. /sm [-z] [msg] Send message to the connected station. The -z option compresses the message to minimize transfer time. The message text may follow, but if not given then the message composer opens for input. /mlist Return a list of messages in the remote station's outbox that are addressed to your station. Requires that your station be authenticated with the remote station. If not, then the remote station will respond with an authentication challenge. 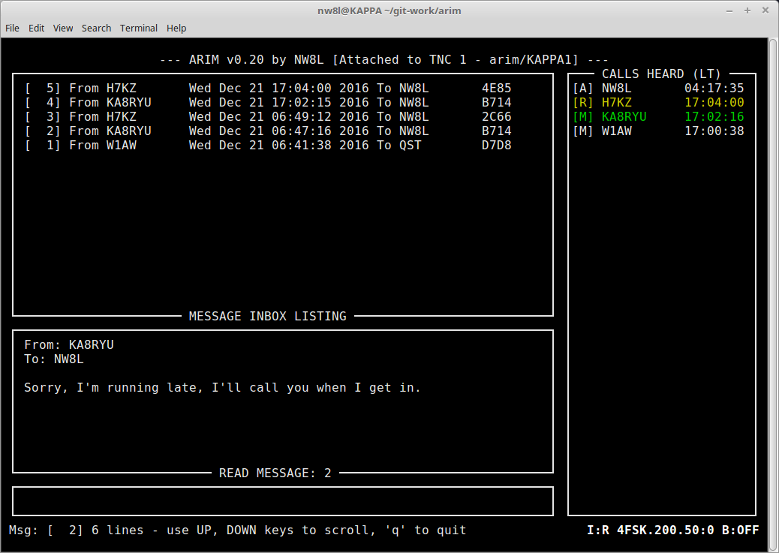 /mget [-z] [nbr] Download messages addressed to your station from the remote station's outbox to your inbox. The -z option compresses the message to minimize transfer time. nbr optionally specifies the maximum number of messages to download. The default is 10. Requires that your station be authenticated with the remote station. If not, then the remote station will respond with an authentication challenge. /flist [dir] Return a list of shared files and directories. dir is an optional directory path, relative to the shared files root directory, e.g. contests/2016/FOBB. If dir is not given, then the the shared files root directory is listed; otherwise the specified directory is listed. By default only files in the shared files root directory and dynamic files are listed. Subdirectories are not listed unless they are made visible by an add-files-dir configuration file parameter. Access-controlled subdirectories defined by the ac-files-dir configuration file parameter are indicated with the ! (bang) character like this: !DIR. /flget [-z] [dir] Downloads a list of shared files and directories, then displays it in the remote shared files viewer. The -z option compresses the file to minimize transfer time. dir is an optional directory path, relative to the shared files root directory, e.g. contests/2016/FOBB. If dir is not given, then the the shared files root directory is listed; otherwise the specified directory is listed. By default only files in the shared files root directory and dynamic files are listed. Subdirectories are not listed unless they are made visible by an add-files-dir configuration file parameter. Access-controlled subdirectories defined by the ac-files-dir configuration file parameter are indicated with the ! (bang) character like this: !DIR. The viewer shows a numbered list of files and directories, making it easy to read or download files without typing in lengthy file names. Learn more about using /flget here. /fget [-z] fn [> dir] Download a file to the local station. The -z option compresses the file to minimize transfer time. fn is the name of a file in the remote station's shared files directory, or a file path relative to it, e.g. contests/2016/FOBB.log. The optional dir parameter specifies the destination directory at the local station, relative to the shared files root directory, e.g. contests/2016. The destination directory must made visible by an add-files-dir configuration file parameter at the local station. If dir is not specified, the file is stored in the download subdirectory in the local station's shared files root directory. ARIM will create the destination directory if it doesn't already exist. /fput [-z] fn [> dir] Upload a file to the remote station. The -z option compresses the file to minimize transfer time. fn is the name of a file in the local station's shared files directory, or a file path relative to it, e.g. contests/2016/FOBB.log. The optional dir parameter specifies the destination directory at the remote station, relative to the shared files root directory, e.g. contests/2016. If dir is not specified, the file is stored in the download subdirectory in the remote station's shared files root directory. The destination directory must made visible by an add-files-dir configuration file parameter at the remote station. ARIM will create the destination directory if it doesn't already exist. /auth Manually trigger the mutual authentication process. passwd client-call server-call password Create or change a password in the local password digest file. client-call is the call sign of the client station. 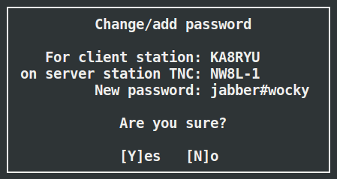 This is a station whose operator will connect to another station, the server station, and use the password to authenticate when challenged. server-call is the call sign of the TNC at the server station to which the client station connects. This is the call sign set by the mycall parameter in the corresponding [tnc] section in the arim.ini configuration file at the server station. password is the password, which may include any printable character, and has a maximum length of 32 characters. Note: passwords are case sensitive! delpass client-call server-call Delete a password in the local password digest file. client-call is the call sign of the client station, and server-call is the call sign of the server station. theme name Change the UI theme. name identifies the theme, which may be one of the built-in themes DARK and LIGHT, or a custom theme defined in the arim-theme file. A theme controls the color coding and text attributes of various UI elements. The effect of this command is immediate; the terminal window is erased and re-drawn using the specified theme. Note: theme names are not case sensitive. Basic line editing features are available on the command prompt. The left and right arrow keys, HOME, END, DEL and backspace keys work as expected. This makes it easy to correct mistakes in typing, whether a entering a command or composing a message. For those familiar with the Emacs style line editing in Linux: CTRL-A, CTRL-E, CTRL-F, CTRL-B, CTRL-D, CTRL-K and CTRL-U can be used instead. The command prompt has a history buffer which holds the last 15 unique commands entered. Use the UP and DOWN keys to browse command history when you want to reuse a previously sent command. For those familiar with Linux command history navigation, the CTRL-P and CTRL-N keys can be used instead. A TNC must be attached. Press the spacebar to open the command prompt. Prefix the message with the '!' character. Press ENTER to send the command to the TNC. The command trace will appear in the TNC command view, followed by the TNC's response if it was a query. To set a TNC parameter, follow the command with the parameter, e.g. !CWID TRUE. To query a TNC parameter, send the command without any argument, e.g. !CWID. Complete control over the TNC is available using this interface. 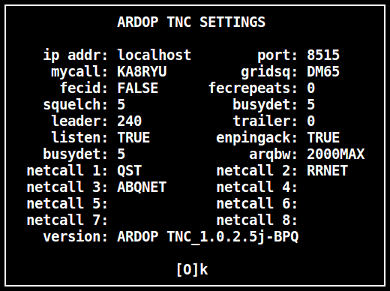 ARDOP TNC commands are documented in the Host Interface Spec for the ARDOP TNC by Rick Muething, KN6KB and available in the files area of the ARDOP users group at groups.io. enpingack Control whether or not the TNC responds to pings from another station. The change will be confirmed by a message on the Status Bar. When attached to a TNC, any ARDOP parameter may be queried or changed at the command prompt using bang commands. These are prefixed with the '!' character and are sent directly to the TNC. For example, !SENDID queries the SENDID parameter, and !BUSYDET 5 sets the BUSYDET parameter to '5'. 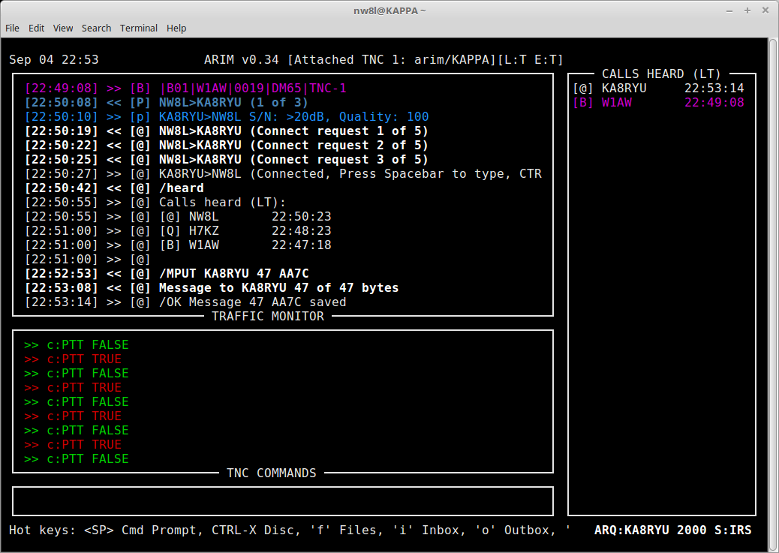 ARDOP TNC commands are described in the ARDOP_2 Protocol Native TNC Commands document by KN6KB. The current version is located in the files section of the ARDOP Developers Group. Enter the message line-by-line at the command prompt, then enter /ex at the start of a new line to close the message composer view and send the message to the outbox. To cancel a message enter /can at the start of a new line. This will discard the message and close the composer view. The format is ping call nbr. The ping repeat count must follow the target call sign. This is the number of times the PING packet will be sent in the absence of a response from the target station before the TNC "gives up". The minimum repeat count is 2 and the maximum is 15. The response from the target station will include a signal report including the signal-to-noise ratio and a constellation quality figure ranging from 0-100%. If the RF channel is busy, ARIM won't send the ping, and an error message will be shown on the status bar. pilot-ping The number of times a pilot ping will be repeated in the absence of a response from the recipient. It is recommended that this value not exceed 3 to prevent tying up the channel with repeats in poor conditions. Set to 0 to disable pilot pings; otherwise the range is 2-5. Default: 0.
pilot-ping-thr When pilot pings are enabled, this is the threshold by which signal reports from the target station are judged. If the reported constellation quality is above the threshold, message (or query) transmission proceeds; if below this threshold it is canceled. It is recommended that this value be 60 or higher; choose a threshold suitable for the FEC mode in use. Min is 50, Max is 100. Default: 60. The change will be confirmed by a message on the Status Bar. When in doubt, use the ppset command to check settings. 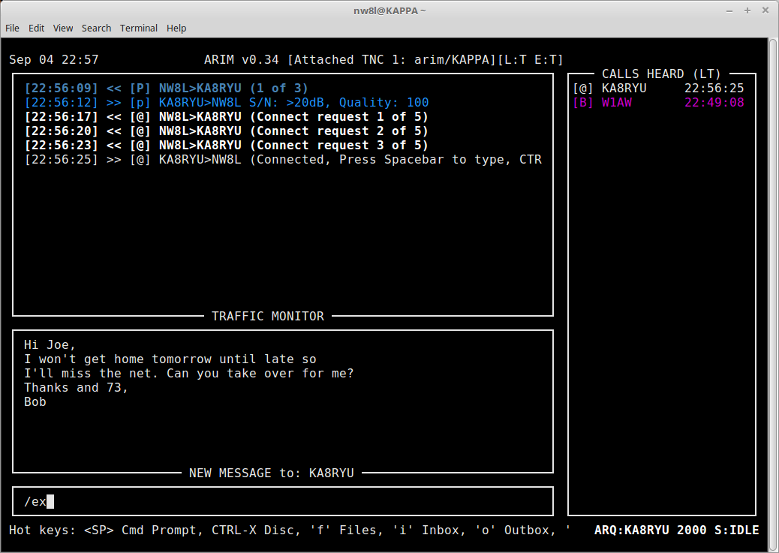 ARIM can act as an ARQ client or server, interoperating with ARDOP Chat or another ARIM station for keyboard to keyboard chat. 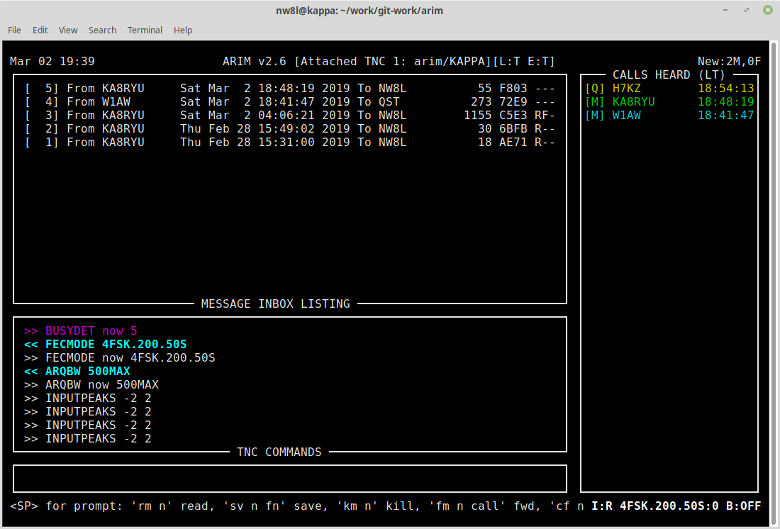 ARIM may also be used as an ARQ client to connect to a BPQ BBS with a ARDOP port. The format is conn call nbr [bw] where call is the call sign of the target station, and nbr is the request repeat count. This is the number of times the ARQCALL packet will be sent in the absence of a response from the target station before the TNC "gives up". The minimum repeat count is 3 and the maximum is 15. bw is an optional connection bandwidth (ARQBW) specifier. It can be one of 200, 500, 2500 or any. If any, ARIM will attempt to connect using each ARQBW setting in succession, starting with the current ARQBW setting (set in the ARIM configuration file or by using the arqbw command. This is useful if the ARQBW setting of the remote station is unknown. Connect requests and responses are displayed in the monitor view. 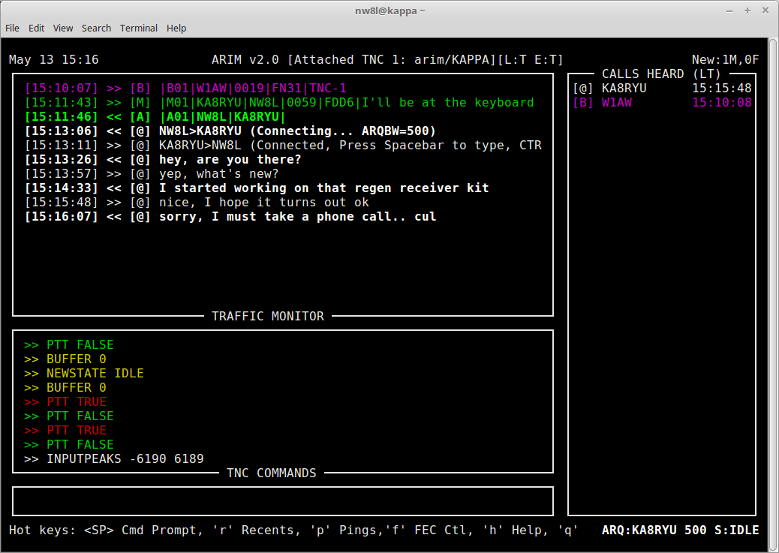 ARDOP 2 TNCs reject connection requests if the ARQBW setting of the calling station exceeds that of the remote station. For this reason, the ARIM 2.x conn command optionally lets the operator specify an ARQ connection bandwidth to override the local ARQBW setting and allow the connection. Alternatively, the operator can use the any specifier to make ARIM discover a workable ARQBW setting automatically (i.e. negotiating the connection bandwidth itself). In this example the proper ARQBW is known to be 500. If the RF channel is busy, ARIM won't send the connection request, and an error message will be shown on the status bar. 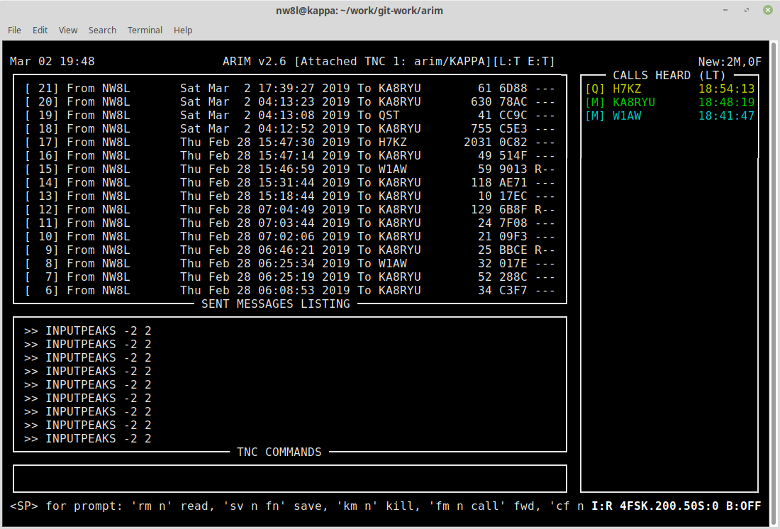 When the connection is made, ARIM will be in ARQ mode, where text entered at the command prompt is sent directly to the remote station rather than processed as an ARIM command. The line editing and history recall features of the command prompt work as usual but the '!' prefix won't work to send commands directly to the TNC, and the ':' prefix won't work to send unproto FEC transmissions. 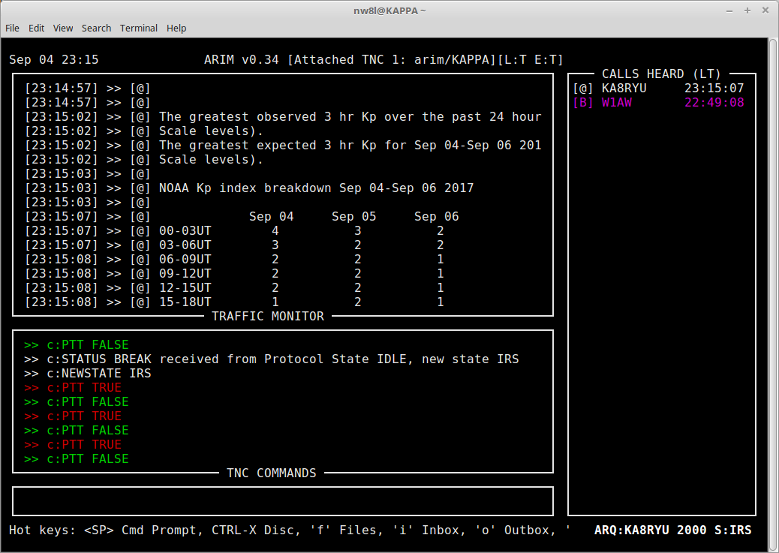 All text sent and received will be displayed on the Traffic Monitor, and the status bar will show the call sign of the remote station, the negotiated max connection bandwidth and the current TNC state. Note: the Recent Messages and Ping History views can't be opened during an ARQ session. 'f' Open the shared files viewer. 'i' Open the message inbox viewer. 'o' Open the message outbox viewer. 's' Open the sent messages viewer. These work as usual in ARQ mode. Files can be uploaded to the remote station from the shared files viewer with the sf [-z] n [dir] command. Previously composed messages can be sent to the remote station from the message outbox viewer with the sm n command. Messages can be forwarded to the remote station from the message inbox and sent messages viewers with the fm n commands. To disconnect, press CTRL-X or enter the special command '/dis' at the command prompt and press ENTER. Type 'y' and a clean disconnect will be attempted. listen Control whether or not the TNC responds to ARQ connect requests or pings. Default: TRUE. arq-bandwidth Set the bandwidth for ARQ connections. The value must be one of: 200, 500 or 2500. Default is 500.
arq-negotiate-bw Controls whether or not the TNC will negotiate ARQ bandwidth for incoming connections. Default: TRUE. This feature currently supported by ARDOP_2Win TNC version 2.0.4 only. arq-timeout Set the inactivity timeout for ARQ connections, in seconds. The value must be in the range 30 to 600. Default is 120.
arq-sendcr Control whether or not CRLF line endings are sent in ARQ mode, instead of Unix style LF endings. Default: TRUE. arqnegbw Controls whether or not the TNC will negotiate ARQ bandwidth for incoming connections. Value must be TRUE or FALSE. Example: arqnegbw TRUE This feature currently supported by ARDOP_2Win TNC version 2.0.4 only. If pilot pings are enabled they will apply to ARQ connection requests, so that the RF path to the remote station can be tested in advance. If the pilot pings fail, the connection attempt will be canceled. /version Return the software version numbers for ARIM and the ARDOP TNC. /gridsq Return the Maidenhead locator (gridsquare). /info Return the info statement. /pname Return the port name for the TNC. /heard Return the calls heard list. /netcalls Return the net call signs list. /flist [dir] Return a list of shared files and directories. dir is an optional directory path, relative to the shared files root directory, e.g. contests/2016/FOBB. If dir is not given, then the the shared files root directory is listed; otherwise the specified directory is listed. By default only files in the shared files root directory and dynamic files are listed. Subdirectories are not listed unless they are made visible by an add-files-dir configuration file parameter. Starting with ARIM version 1.2, access-controlled subdirectories defined by the ac-files-dir configuration file parameter are indicated with the ! (bang) character like this: !DIR. /file fn, Print a file to the traffic monitor view. fn is the name of a file in the shared files root directory at the remote station, or a file path relative to it, e.g. contests/2016/FOBB.log. The remote station saves the message to its inbox and returns an /OK response to confirm receipt. A copy will be stored in your sent messages mailbox. Enter the message line-by-line at the command prompt. When done, enter /ex at the start of a new line to close the message composer view and send the message on its way. To cancel a message you've started to send, enter /can at the start of a new line to close the message composer view and discard the message. If the remote ARIM station encounters an error saving the message, it returns an /ERROR response and the message is discarded. Use the -z option to compress the message to reduce transfer time. The message will be automatically decompressed at the receiving station before it is saved to the inbox there. Enter the sm n command to start the upload. This is a more efficient method than composing the messages during the ARQ session itself. Alternatively, use the sm -z n command to compress the message before it is sent. This can reduce transfer time for larger messages. Messages in the inbox can be forwarded to the remote station. Press 'i' to open the message inbox viewer and enter the fm n command to start the upload. Alternatively, use the fm -z n command to compress the message before it is sent. This can reduce transfer time for larger messages. Messages in the sent messages mailbox can also be forwarded to the remote station. Press 's' to open the sent messages viewer and enter the fm n command to start the upload. Alternatively, use the fm -z n command to compress the message before it is sent. This can reduce transfer time for larger messages. /mlist Return a list of messages in the remote station's outbox that are addressed to your station's call sign. Requires that your station be authenticated with the remote station. If not, then the remote station will respond with an authentication challenge. /mget [-z] [nbr] Download messages addressed to the your station's call sign, from the remote station's outbox to your station's inbox. The -z option compresses messages to minimize transfer time. nbr optionally specifies the maximum number of messages to download. The default is 10. Requires that your station be authenticated with the remote station. If not, then the remote station will respond with an authentication challenge. In this example, the command triggers the mutual authentication process automatically. After that, the listing is received. The messages are listed in chronological order (oldest first). The progress of the download is reported as each message is received. As each message is received, the receiving station stores the message in its inbox and sends a /OK response to confirm receipt. The sending station then deletes the message from its outbox. If the either station encounters an error, it sends an /ERROR response to the other and the download is canceled. In that case the message is not deleted from the outbox at the sending station. To cancel the download, press CTRL-X to close the ARQ connection. Use the /mget -z command to compress the message before it is sent. This can reduce transfer time for large messages. Use the /mget nbr command to limit the number of messages downloaded. If less than the number of messages available, then the oldest nbr are downloaded. The minimum value of nbr is 1 and the maximum is 10. This option can be combined with the -z option. /flist [dir] Return a list of shared files and directories. dir is an optional directory path, relative to the shared files root directory, e.g. contests/2016/FOBB. If dir is not given, then the the shared files root directory is listed; otherwise the specified directory is listed. /flget [-z] [dir] Downloads a list of shared files and directories, then displays it in the remote shared files viewer. The -z option compresses the file to minimize transfer time. dir is an optional directory path, relative to the shared files root directory, e.g. contests/2016/FOBB. If dir is not given, then the the shared files root directory is listed; otherwise the specified directory is listed. The viewer shows a numbered list of files and directories, making it easy to read or download files without typing in lengthy file names. By default, only files in the shared files root directory and dynamic files are listed. Subdirectories are not listed unless they are made visible by an add-files-dir configuration file parameter. Access-controlled subdirectories defined by the ac-files-dir configuration file parameter are indicated with the ! (bang) character like this: !DIR. The contents of the directory are listed, one to a line. For files, the name and size in bytes are shown. For subdirectories, the name is shown. Access-controlled subdirectories are indicated with the ! (bang) character like this: !DIR. The remote directory path is shown in the title of the viewer window. rf nbr Read file number nbr in the file viewer. gf [-z] nbr [dir] Download file number nbr. Use the -z switch to enable compression to reduce transfer time. The optional dir parameter specifies the destination directory at the local station, relative to the shared files root directory, e.g. contests/2016. cd [-z] nbr Download a file listing for directory nbr in the shared files viewer and display it in the remote shared files viewer. Use the -z switch to enable compression to reduce transfer time. Press 'q' to quit the viewer. The remote shared files viewer automatically closes when a command is invoked. However, the file listing is not lost; press the hot key '#' to reopen the viewer if you need to download another file from the directory. The mutual authentication process will be triggered automatically if /flist or /flget are used to list access-controlled directories when the session is not yet authenticated. /flget [-z] [dir] Downloads a list of shared files and directories, then displays it in the remote shared files viewer. The -z option compresses the file to minimize transfer time. dir is an optional directory path, relative to the shared files root directory, e.g. contests/2016/FOBB. If dir is not given, then the the shared files root directory is listed; otherwise the specified directory is listed. The viewer shows a numbered list of files and directories, making it easy to read or download files without typing in lengthy file names. Learn more about using /flget here. The text is printed the the Traffic Monitor view line by line as it is received. /flist [dir] Return a list of shared files and directories. dir is an optional directory path, relative to the shared files root directory, e.g. contests/2016/FOBB. If dir is not given, then the the shared files root directory is listed; otherwise the specified directory is listed. By default only files in the shared files root directory and dynamic files are listed. Subdirectories are not listed unless they are made visible by an add-files-dir configuration file parameter at the remote station. Access-controlled subdirectories defined by the ac-files-dir configuration file parameter are indicated with the ! (bang) character like this: !DIR. /flget [-z] [dir] Downloads a list of shared files and directories, then displays it in the remote shared files viewer. The -z option compresses the file to minimize transfer time. dir is an optional directory path, relative to the shared files root directory, e.g. contests/2016/FOBB. If dir is not given, then the the shared files root directory is listed; otherwise the specified directory is listed. The viewer lets you read or download files without typing in lengthy file names. Learn more about using /flget here. /fget [-z] fn [> dir] Download a file to the local station. The -z option compresses the file to minimize transfer time. fn is the name of a file in the remote station's shared files directory, or a file path relative to it, e.g. contests/2016/FOBB.log. The optional dir parameter specifies the destination directory at the local station, relative the the shared files root directory, e.g. contests/2016. The destination directory must made visible by an add-files-dir configuration file parameter at the local station. If dir is not specified, the file is stored in the download subdirectory in the local station's shared files root directory. ARIM will create the destination directory if it doesn't already exist. The directory path is shown in the title of the viewer window. The contents of the directory are listed, one to a line. For files, the name and size in bytes are shown. For subdirectories, the name is shown. Access-controlled subdirectories are indicated with the ! (bang) character like this: !DIR. The progress of the download is reported as each data frame is received. When it's complete an /OK response is sent to the remote station to confirm receipt. If the remote ARIM station encounters an error sending the file, it returns an /ERROR response and the download is canceled. By default, downloaded files are stored in the download subdirectory in the local station's shared files root directory. ARIM will create this if it doesn't already exist. Use the gf -z nbr command to compress the file before it is sent. This can reduce transfer time for larger files. Note that compression isn't useful for very small files, or files that are already compressed (e.g. "zip" files or many image file types). In these cases the zlib format overhead can make the file size increase, not decrease. Use the gf [-z] nbr dir command to store the file to a location other than the default download directory. The dir parameter specifies the destination directory as a path relative to the shared files root directory at the local station, e.g. contests/2016. This option can be combined with the -z option. When connected to an ARIM station local files can be uploaded to the remote station. Both text and binary file types can be transferred over the ARQ connection. A compression option can be invoked to reduce transfer time for many file types, and you can specify a destination directory at the remote station other than the default. If you do, the destination directory must made visible by an add-files-dir configuration file parameter at the remote station. If not specified, the file is stored in the download subdirectory in the remote station's shared files root directory. Press the 'f' hot key in ARQ mode to open the shared files viewer and locate the file you wish to send. Press 'q' to quit the shared files viewer. The progress of the upload is reported as each data frame is sent. When it's complete an /OK response is received from the remote station to confirm the file was saved. If the remote ARIM station encounters an error receiving the file, it returns an /ERROR response and the upload is canceled. Uploaded files are stored in the destination directory on the remote station. ARIM will create this if it doesn't already exist. To cancel the upload, press CTRL-X to close the ARQ connection. Use the sf -z n command to compress the file before it is sent. This can reduce transfer time for larger files. Note that compression isn't useful for very small files, or files that are already compressed (e.g. "zip" files or many image file types). In these cases the zlib format overhead can make the file size increase, not decrease. Use the sf [-z] n dir command to store the file to a location other than the default download directory. The dir parameter specifies the destination directory as a path relative to the shared files root directory at the remote station, e.g. contests/2016. If you do, the destination directory must made visible by an add-files-dir configuration file parameter at the remote station. This option can be combined with the -z option. Once an ARQ connection is established, the operator can invoke the mutual authentication process manually using the /auth command. If it succeeds, the identity of the remote station is proven and the operator can read, upload or download files with confidence. If it fails, because one station or the other doesn't know the shared secret (password), the operator is presented with a warning message and given the choice of either continuing or terminating the ARQ session. The remote station sends a challenge which is the first of 3 messages (A1, A2 and A3) exchanged during the authentication process. In either case the problem is likely to be missing or incorrect password digest file entries. At the server station, ARIM receives the command and recognizes that authentication is required. It searches its password digest file for an entry with the client station's call sign as the client and its own call sign as the server. If it cannot find such an entry, it responds with /EAUTH and the operator at the client station is informed that authentication has failed. If ARIM does find such an entry, it responds with an authentication challenge in the form of the /A1 command. The challenge includes an opaque nonce, a token whose content it controls and which must be incorporated into the response made by the client station. H(x) is the Blake2 hash of an array of data 'x'. HA1 is H(client_call:server_call:password), the password hash token stored in the password digest file at the client station. nonce is the token sent by the challenger to influence the response hash value. HA2 is H(method:path) where method' is FPUT, FGET, FLIST or FILE and path is the directory or file path referenced by the command. Thus the response to each challenge is unique, in a way dependent on the nature of the request and the nonce issued by the challenger. This makes "replay" attacks difficult to mount and recovery of the password from the response token computationally infeasible. ARIM sends the response token plus a challenge nonce to the server station in the form of the /A2 command. At the server station, ARIM receives the /A2 command and checks the challenge response token it contains. It does this by computing the response token it expects using the password digest token (HA1) stored in the password digest file it owns. It compares this with the response token received from the client station. If they don't match, then the client station must not have the same password digest that ARIM has stored locally. In this case ARIM will send /EAUTH to the client station where the operator will be informed that authentication has failed. If they match, then the client station has proven its authenticity and ARIM will send a response to the challenge contained in the /A2 command. As before, this is computed as H(HA1:nonce:HA2), using the challenge nonce received from the client station. It sends this response to the client station in the form of the /A3 command. At the client station, ARIM receives the /A3 command and checks the challenge response token it contains. It does this by computing the response token it expects using the password digest token (HA1) stored in the password digest file it owns. It compares this with the response token received from the server station. If they don't match, the server station must not have the same password digest that ARIM has stored locally. In this case ARIM will inform the operator that authentication has failed. If they match, then the server station has proven its authenticity and ARIM re-sends the command that triggered the process, unless it was the /auth command. In that case there is no work to do, so ARIM simply sends the /OK response to signal that the mutual authentication is complete. To strike a reasonable balance between security and the "air time" cost of the challenge/response data exchanges, challenge nonces contain 6 bytes of data and the Blake2 response hash is truncated to 21 bytes, or 168 bits (big enough for excellent collision resistance). These are sent in base64 encoded form making the over-the-air sizes 8 and 28 bytes respectively. The operator at KA8RYU connects to NW8L-1 and reads the space weather report. Next he attempts to download a controlled file, admin/contact-list.txt with the /fget command. This triggers an authentication challenge from NW8L-1 in the form of the /A1 command. The mutual authentication succeeds, so the /fget command is automatically repeated and the file is downloaded. Note the + character appended to NW8L-1's call sign in the status bar. This indicates that the ARQ session is authenticated. If mutual authentication succeeds, subsequent accesses of controlled resources on the remote station proceed normally. Otherwise the authentication process proceeds as usual. Note: shared files directories defined by add-files-dir parameters in the arim.ini configuration file are not access-controlled. These are accessible by any station in ARQ and FEC mode operations. Likewise, the root shared files directory is always accessible by any station for file listing, uploads and downloads. Passwords are created at the ARIM command prompt with the passwd command and stored in digest ("hashed") form in a file. 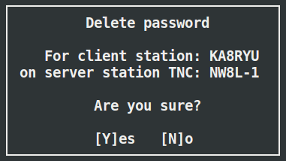 Passwords are hashed with a salt (the call signs of the corresponding stations), so that any given password results in unique hash for different call sign pairs. This hash is identical to the HA1 term used in the digest authentication scheme, so it can be read out of the password digest file when needed, making it unnecessary to store the original password. Mathematically, the Blake2 hash function is a strong one way function; it is computationally infeasible to recover the password from the hash. Because the password hash is stored in a file the authentication process can operate without operator intervention; there's no need to remember and enter the password each time. attempting to access a controlled resource at the other when the ARQ session is not yet authenticated. When this happens the other station assumes the role of server and responds with an authentication challenge. These definitions imply that an operator is always present at the client station, but not at the server station, which is assumed to be operating automatically. However, once an ARQ connection is established between two stations, the operator at either end can seize the client role by being the first to trigger the mutual authentication process. There are two entries, one for KA8RYU as client and NW8L-1 as server, and another for NW8L-1 as client and KA8RYU as server. This allows both one-way and two-way relationships to be defined. For instance, a station serving as a document repository can issue passwords to multiple stations who connect to it as clients and access the controlled files it offers. However, no such password is issued to the repository station by the client stations; it cannot connect to any of them in the client role and authenticate for the purpose of accessing any controlled resources they publish. To protect against accidental disclosure of password digest file contents, any file named 'arim-digest', or variations like 'arim-digest.bak', no matter where located in the file system, are protected against access by a remote station. Avoid easy-to-guess passwords, and never include the call signs of the client or server stations in the password. While the base64 encoded Blake2 digest (HA1) may look quite random, it contains only as much entropy as the original password, so choose passwords well. Note: passwords are case sensitive! Press 'y' to delete the password digest from the file. A TNC must be attached and the RF channel must not be busy. Press the spacebar to open the command prompt. Prefix the message with the ':' character. Press ENTER to send the message out over the air as raw ARDOP FEC frames, rather than being formatted as an ARIM message. The message will appear in the monitor view tagged with the [U] indicator. If the RF channel is busy, ARIM won't send the unproto message, and an error message will be shown on the status bar. The message will be sent immediately after pressing the ENTER key to complete the command. A copy will be stored in your sent messages mailbox. If the RF channel is busy, ARIM won't send the message, and an error message will be shown on the status bar. Enter the message line-by-line at the command prompt. When done, enter /ex at the start of a new line to close the message composer view and send the message on its way. A copy will be stored in your sent messages mailbox. The monitor view shows the outbound message and the inbound ACK from the recipient station. Press 'y' to store the message to the outbox, 'n' to discard it. When in the inbox or outbox viewer, press the spacebar to open the command prompt and enter the rm nbr command where nbr is the message number. This opens the message viewer. The message number and size in lines are shown in the Status Bar. Use the UP and DOWN arrow keys or the PAGEUP, PAGEDOWN, HOME and END keys to scroll through the message. Press 'q' to quit the message viewer and return to the message header view. 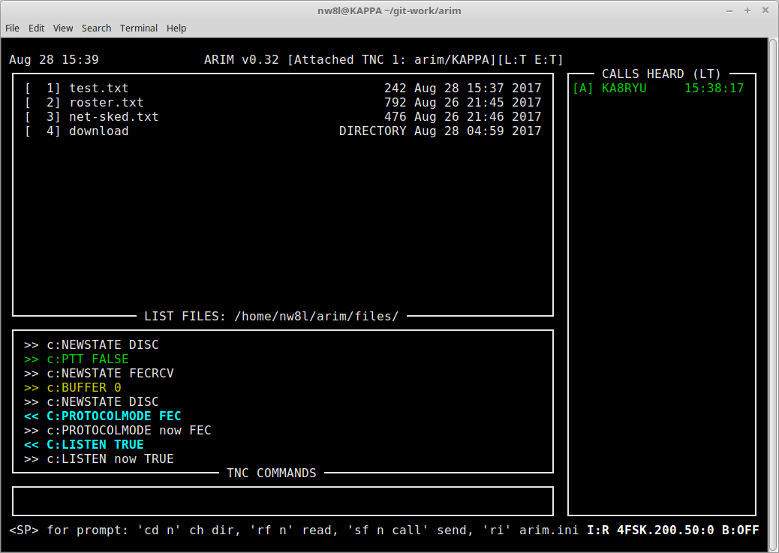 version Query version of ARIM program and attached ARDOP TNC. gridsq Query gridsquare of target station (from arim.ini configuration file). pname Query name of attached ARDOP TNC (from arim.ini configuration file). info Query info text for the attached ARDOP TNC (from arim.ini configuration file). heard Query calls heard list of target station. netcalls Query net call signs list of target station. flist [dir] Query shared files listing from target station. dir is an optional directory path, relative to the shared files root directory, e.g. contests/2016/FOBB. If dir is not given, then the the shared files root directory is listed; otherwise the specified directory is listed. By default only files in the shared files root directory and dynamic files are listed. Subdirectories are not listed unless they are made visible by an add-files-dir configuration file parameter. Access-controlled subdirectories defined by the ac-files-dir configuration file parameter are indicated with the ! (bang) character like this: !DIR. file fn Query file fn, where fn is the name of a file in the shared files directory, or a file path relative to it, e.g. contests/2016/FOBB.log. The target station will send the requested information in a response message. The response message will appear in the monitor view tagged with the [R] indicator. It will be stored in the message inbox for later viewing, and also appear in the Recents list. If the RF channel is busy, ARIM won't send the query, and an error message will be shown on the status bar. Use the sq call flist [dir] query to get a list of shared files from station call where dir is an optional directory path, relative to the shared files root directory, e.g. contests/2016/FOBB. The list will be returned in the response message which is stored into the inbox. Note the name of the file you wish to get. NOTE: Static files have their size in bytes listed with the file name. Dynamic files have the DYN label listed with the file name to indicate that their size is variable. Press 'q' to close the message viewer and 'q' again to close the message inbox view. Now use the sq call file fname command to query the file fname from station call. NOTE: file names are case sensitive! The file will be returned in the response message. The message is stored into the inbox where it can be viewed or saved to disk. NOTE: the maximum file size is set by the max-file-size parameter in the [arim] section of the arim.ini configuration file. The file list returned by the flist query is filtered so that only static files less than the max size are listed, and the output of dynamic files is limited to the max size. At this time the absolute maximum allowed is 16384 bytes. The location of the shared files root directory is set by the files-dir parameter in the [arim] section of the arim.ini configuration file. send repeats - this is the number of times a message send will be repeated in the absence of an ACK response from the recipient. ack timeout period - after sending a message, this is the maximum time in seconds that ARIM will wait for an ACK before repeating it. FEC mode downshifting - if enabled, downshifting causes each message repeat to be made in a more robust FEC mode than the previous repeat in hopes of getting through in poor conditions. The starting FEC mode is automatically restored at the conclusion of the message repeats. The change will be confirmed by a message on the Status Bar. When in doubt, use the srset command to check settings. Beaconing can be configured for each TNC by the btime parameter in the relevant [tnc] section of the arim.ini configuration file. This parameter defines the beacon interval time in minutes, with '0' meaning that beaconing is disabled. When attached to a TNC, beaconing can be managed using the btime and btest commands. Use btime nbr to set the beacon interval to nbr minutes, and btest to test the beacon. The beacon status indicator in the Status Bar shows the interval time when beaconing is enabled, or "OFF" when disabled. If the RF channel is busy, ARIM won't send the beacon, and an error message will be shown on the status bar. In the case of beacons scheduled every btime seconds, ARIM will try again once, 2 minutes later. If the RF channel remains busy, ARIM gives up and schedules the next beacon btime seconds later. Press the spacebar to open the command prompt and enter the li command to open the message inbox viewer. rm nbr Read message number nbr in the message viewer. km nbr Kill (delete) message number nbr. pm nbr Purge (delete) all messages older than nbr days. sv nbr fname Save message nbr to file fname. fname can be an absolute path like /home/nw8l/foo.txt or a relative path like foo.txt or files/foo.txt. Relative paths are relative to the ARIM working directory (the current directory when arim was invoked). fm nbr call Forward message number nbr to station call. Only available when attached to a TNC. cf nbr flag Clear flag flag on message number nbr. flag is one of R (read), F (forwarded), S (saved) or * (all flags). Press 'q' to quit. Note: the automatic message purge process runs whenever this view is opened. This discards messages whose age in days exceeds the limit set by the max-msg-days parameter in the [arim] section of the arim.ini configuration file. Set it to 0 to disable automatic message purging. The default setting is 0. Previously composed messages and messages saved after a failed send operation are stored here. Press the spacebar to open the command prompt and enter the lo command to open the message outbox viewer. sm nbr Send message nbr if attached to a TNC. Press the spacebar to open the command prompt and enter the ls command to open the sent message viewer. The optional message tracing feature inserts headers like Received: from KA8RYU by NW8L; Jan 30 2019 05:01:48 UTC into received messages. If the message is forwarded to another station with tracing enabled, another Received: header is added by the receiving station, and so on. In this way a record of the message's progress through a network is built up as it is forwarded from station to station (read from bottom to top). The Received: headers are visible in the message viewer together with the From: and To: headers. However, being message header lines, they are not visible and cannot be changed when sending or forwarding a message. This feature is compatible with previous versions of gARIM and ARIM. The timestamp included in the Received: headers indicates time of receipt, either local time or UTC time at the receiving station, as set by the utc-time parameter in the [ui] section of the arim.ini configuration file. No time zone is included for stations configured for local time stamps (utc-time=FALSE). Message tracing is enabled or disabled by the value of the msg-trace-en parameter in the [arim] section of the configuration file. Set to TRUE to enable tracing or FALSE to disable it. The default value is FALSE. Press the spacebar to open the command prompt and enter the lf command to open the shared files viewer. The viewer opens in the shared files root directory defined by the files-dir parameter in the [arim] section of the arim.ini configuration file. The directory path is shown in the title of the viewer window. The contents of the directory are listed, one to a line. For files, the name, size in bytes and the last-modified date are shown. For subdirectories, the name and last-modified date are shown. Access-controlled subdirectories defined by the ac-files-dir configuration file parameter are indicated with the ! (bang) character like this: !DIRECTORY. sf nbr call Send file number nbr to station call if attached to a TNC. ri Read the arim.ini configuration file, no matter where it is located. rp Read the arim-digest password digest file. rt Read the arim-themes UI themes file. cd nbr Open directory nbr in the shared files viewer and list its files. When you open a directory with the cd command, the listing includes the parent directory (..) as item number 1. Enter the command cd 1 to return to it. Press 'q' to quit the file viewer. Text files listed in the shared files viewer can be opened for reading. Press the spacebar to open the command prompt and enter the rm nbr command where nbr is the message number. This opens the file reader. The file number and size in lines are shown in the Status Bar. Use the UP and DOWN arrow keys or the PAGEUP, PAGEDOWN, HOME and END keys to scroll through the file. Press 'q' to quit the file reader and return to the shared files viewer. Dynamic files are used to return output from a script or system command executed by ARIM in response to a file query. Make sure that alias is unique among the other dynamic file definitions and file names in the shared files directory. Use absolute paths to script files when ARIM is built from source and installed. Relative paths can be used for "portable" binary installations where the script files are contained in same directory as the arim executable file. You may define no more than 16 dynamic files. In response to the query sq file alias, command will be executed in a shell and its output returned in the response. command can be a batch file, a script invocation like python myscript or a system command like date or uname -a. The output size in bytes is limited by the max-file-size parameter in the [arim] section of the arim.ini configuration file. Errors generated by dynamic file scripts are written to a file named dyn-file-error.log in the log directory. If the RF channel is busy, ARIM will cancel the operation and an error message will be shown on the status bar. If sending a message, the operator is prompted to save it to the outbox to be sent later. This helps prevent collisions between transmissions on a busy channel, for example during net operations. The TNC does not send BUSY notifications to the host program during an ARQ session. busydet sets the threshold for the busy detector. The range is 0 to 10, where 0 means disabled. Lower values make the detector more sensitive, and higher values make it less sensitive. The default value is 5, which works well for most installations. arqbw sets the bandwidth for ARQ mode. This, to a certain extent, controls the bandwidth of the busy detector. Based on testing and my reading of the source code for the ARDOP TNCs, the 200Hz and 500Hz ARQ bandwidths result in a busy detector bandwidth of a little less than 1kHz; the 2500Hz ARQ bandwidth results in a a busy detector bandwidth of a little over 2.5kHz. In some cases, ARIM may not receive a BUSY FALSE notification when one is expected. This can leave ARIM stuck in the [RF CHANNEL BUSY] state, and attempts to start a new operation will fail. If this happens, the operator can recover by pressing the <ESC> key to reset ARIM's busy state. Two logs can be enabled or disabled in the arim.ini configuration file; the traffic log and the debug log. The traffic log is enabled by default and logs the content of all ARIM and ARDOP data frames sent and received by the TNC, with timestamping of each entry. The debug log is disabled by default. It logs all TNC commands sent and received by the ARIM program as well as exceptions encountered in operation like data wait timeouts, communication errors etc. Set the traffic-log parameter in the [log] section of the arim.ini configuration file to TRUE to enable traffic logging and to FALSE to disable it. Set the debug-log parameter in the [log] section of the arim.ini configuration file to TRUE to enable debug logging and to FALSE to disable it. Another log file, the dynamic file error log, is always enabled. It logs error messages from scripts or programs that generate dynamic file text output. Logs are kept in the logs subdirectory of the ARIM working directory. They are automatically rotated every 24 hours. The file name format is name-YYYYMMDD.log where name is either traffic, debug or dyn-file-error, followed by the date, e.g. traffic-20161114.log. When using the TNC-Pi9K6, the TNC must be programmed with the ARDOP Teensy firmware, and the host Raspberry Pi must be configured to assign the proper serial port hardware to the TNC. Configure the Raspberry Pi: Follow the instructions in the TNC-Pi9K6 TNC-Pi9K6 User Guide to use the raspi-config program to enable the serial port. You will address the port as /dev/serial0 in the arim.ini configuration file. Program the TNC-Pi9K6: You must compile and install either the ARDOP_Teensy or ARDOP2_Teensy firmware into the TNC-Pi9K6. Follow the instructions in the TNC-Pi9K6 User Guide to install the Arduino IDE and the Teensyduino add-on, compile from source code and program the TNC. Don't use the TeensyProjects.zip file from the tnc-x website. Instead, download the latest, which is available in the TeensyProjects.zip archive on G8PBQ's download site. This is the up-to-date version. To enable TNC-Pi9K6 debug logging, you must comment out line 79 of the TeensyProjects/libraries/TeensyConfig/TeensyConfigARDOP.h file. Make #define MONPORT Serial look like //#define MONPORT Serial before compiling the program. Set the tncpi9k6-log parameter in the arim.ini configuration file to TRUE to enable or FALSE to disable logging. Normally, the serial port on the RPi GPIO header is used. It's also possible to connect the USB device port on the TNC-Pi9K6 to one of the USB host ports on the RPi. For this to work line 75 of the TeensyConfigARDOP.h file must be changed. Make #define HOSTPORT Serial1 look like #define HOSTPORT Serial before compiling. If you do this, you must address serial port /dev/ttyACM0 in the arim.ini configuration file. The I2C interface with TNC-Pi9K6 is not supported by ARIM at present. Copyright © 2016-2019 by Robert Cunnings NW8L. Last modified: 02 Mar 2019.